Another hot sunny day. 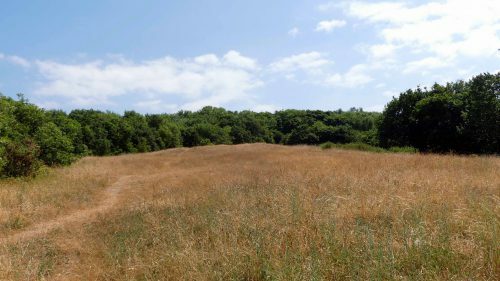 Not my idea of perfect walking weather, but I wanted to see how the hill, or rather its wildlife was holding up under the scorching weather, in particular hoping there would be butterflies. 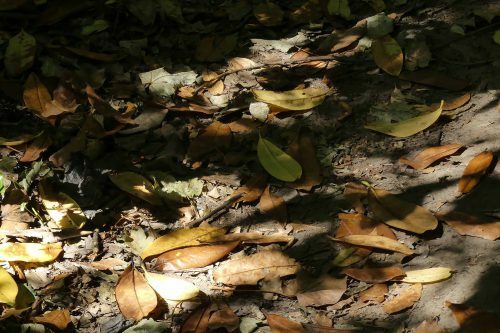 It was pleasantly cooler inside the woods, but the ground was bone dry, hard and at this lower end of the path scattered with shed Laurel leaves, often a sign the plants are short of water. 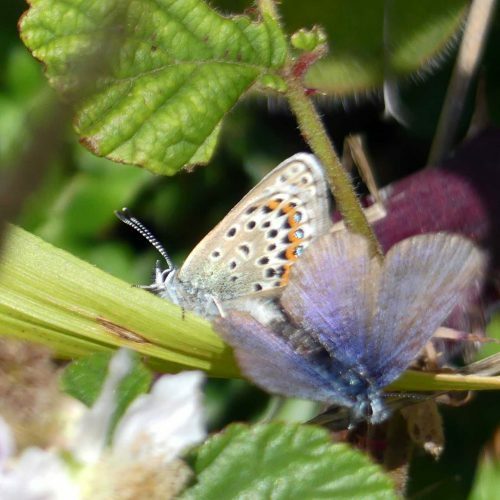 I stopped at the small scrubby patch, often an insect hot-spot. Hot it was, but not with aerial activity. 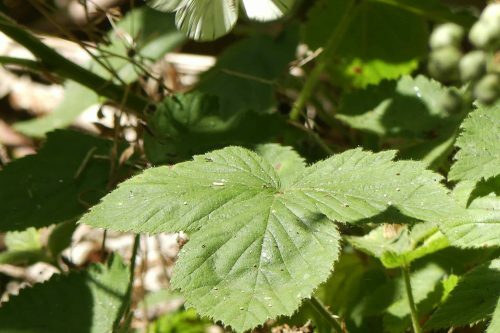 The nettles have flowered and are beginning to set seed and I noticed many of their leaves have been ravaged by insects. That set me thinking about the battles going on all around me between plants and their attackers and some of the other roles that leaves play. 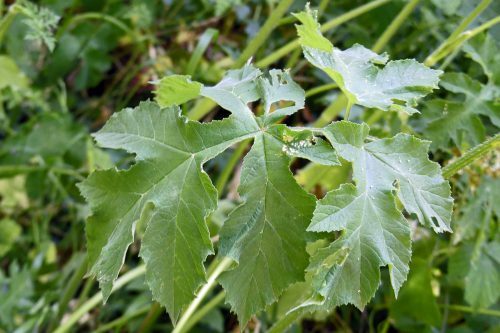 I like to see eaten leaves as it’s a sure sign there are insects about, but of course plants need their leaves to supply them with food, so many do what they can to preserve them. 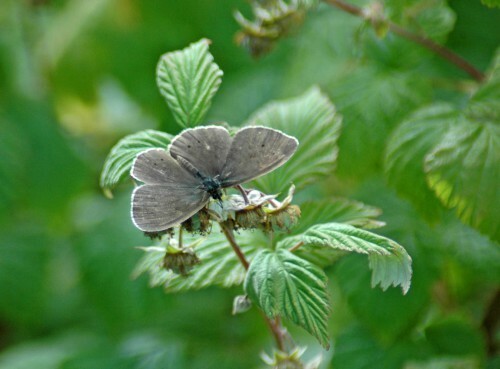 Nettles have particularly aggressive defences; as those having had painful encounters with them will testify. They’re not aimed at us specifically of course, rather at grazing animals. They have stinging hairs, every one tipped with a tiny glassy needle that breaks off at the slightest touch that is sharp enough to cut skin; simultaneously poison is squirted into the wound from a small chamber at the base of each hair. Ouch! Even nibbling rabbits avoid them as they have sensitive noses and find the sting as unpleasant as we do. 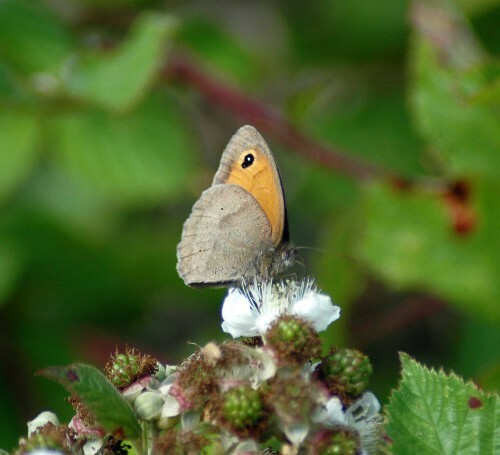 Despite this, nettles are the favoured food of such insects as the caterpillars of the Small Tortoiseshell and Red Admiral butterflies: they simply chomp through the safe juicy parts of the leaf, going around the dangerous stings, leaving them neatly in place. Nearby a more pacific Wild Privet shrub is blossoming. 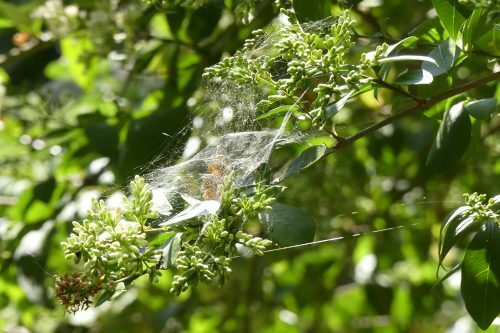 Harmless in itself, but spiders have built webs over their fragrant blossoms in hope of capturing unsuspecting nectar-seeking insects. 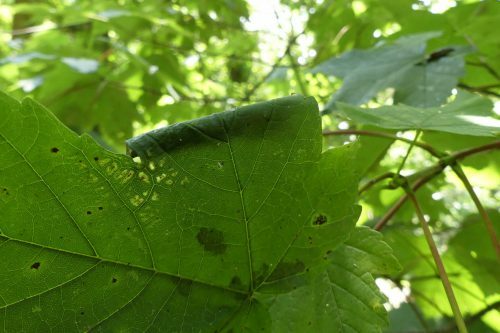 Sycamore leaves are already freckled with Tarspot-Rhytisma acerinum. 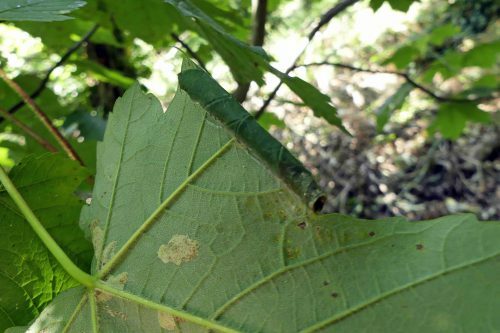 Although it occurs on other trees too, including Willow and Eucalyptus, it is generally referred to as Sycamore Tarspot and by this time of the year it’s practically impossible to find a Sycamore tree without it. This common and widespread fungus doesn’t look pretty, but doesn’t seem to adversely affect the trees it afflicts. Looking at Tarspot I then noticed a leaf that was curled at an edge. I have no idea what had accomplished this neatly rolled cylinder, clearly some species of insect at some stage of its life, but it impressed me greatly. The structure is tightly rolled, like a small cigar, secured along the long edge and open at both ends. There are ‘blisters’ on the leaf too, so I wondered if there may be a connection? 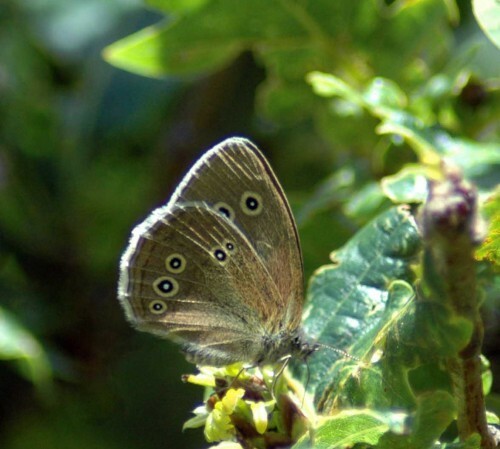 Leaves make perfect landing and resting pads for butterflies too. 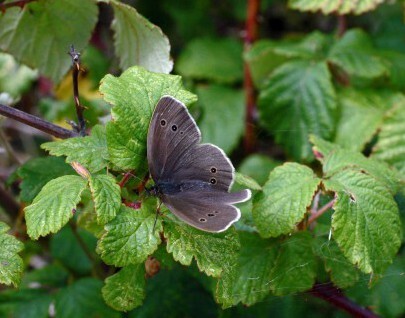 This bramble leaf had served as such for a Green-veined White butterfly that took off just as I’d focussed on it! You can just see it rocketing out of the top of the photograph. 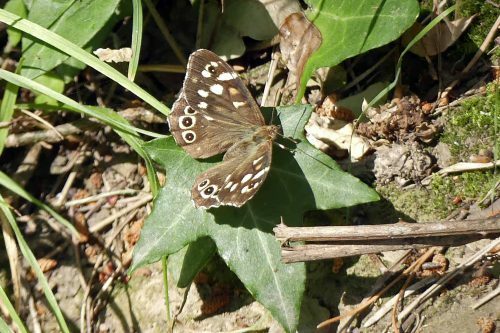 A Speckled Wood was more obliging, pausing on an ivy leaf at ground level. 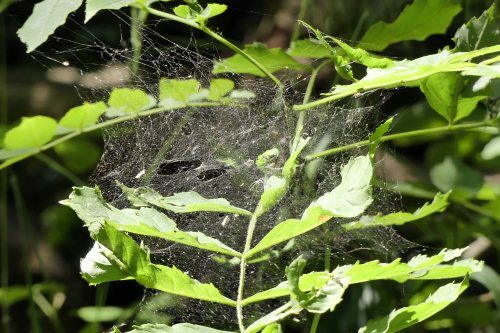 Another spider’s web, this time utilising an Ash leaf. 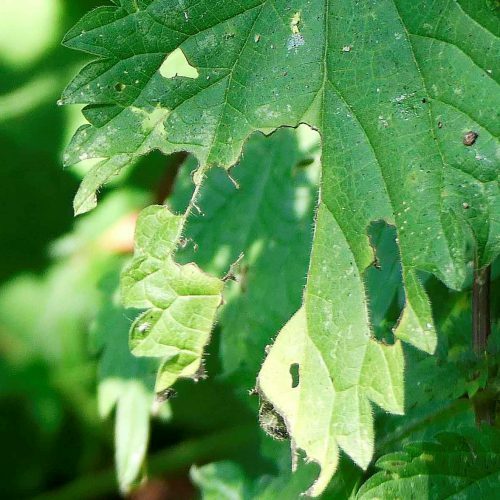 Hogweed has impressively large and interestingly-shaped leaves; this one was showing signs of having been nibbled and there are aphids dotted around on its surface. These plants often play host to great colonies of aphids that pierce the veins of its stems and leaves to feast on its sap. The aphids then attract insects that eat them, such as ladybirds. 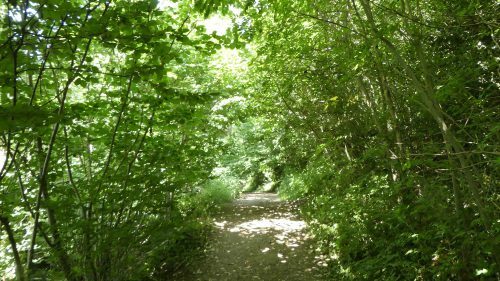 Away from the peaceful confines of the shady wood and out onto the wider more open track I was soon distracted by insect activity. 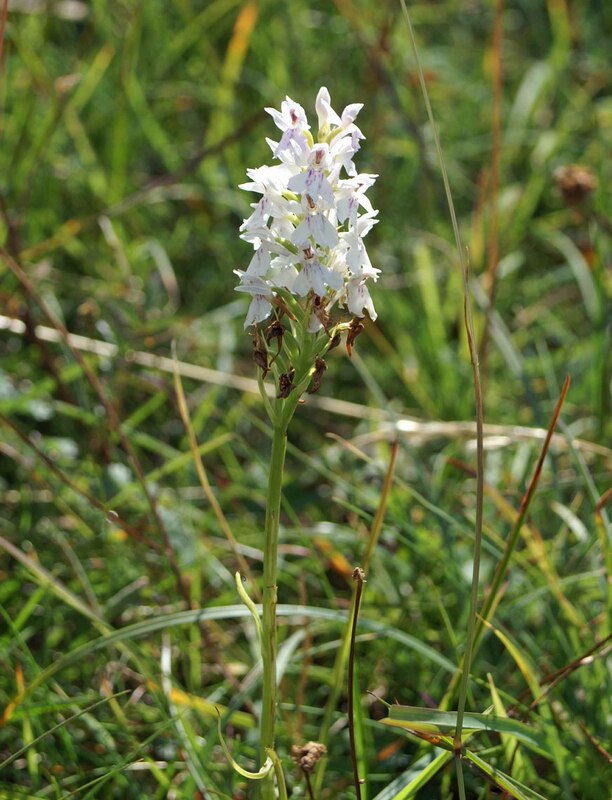 There’s not much about at the moment in the way of wildflowers, so what there is is in high demand. 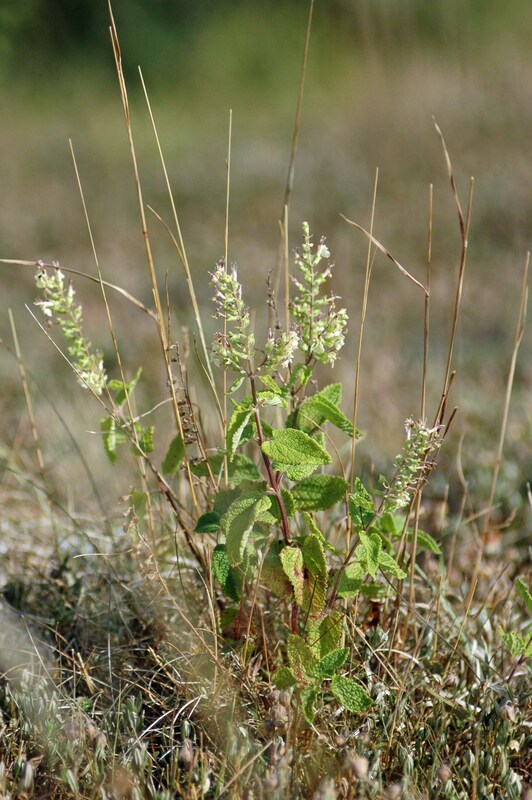 Wood Sage is both still flowering and beginning to set seed. The remaining little flowers of the plants close by were being visited by busy little Carder bees. 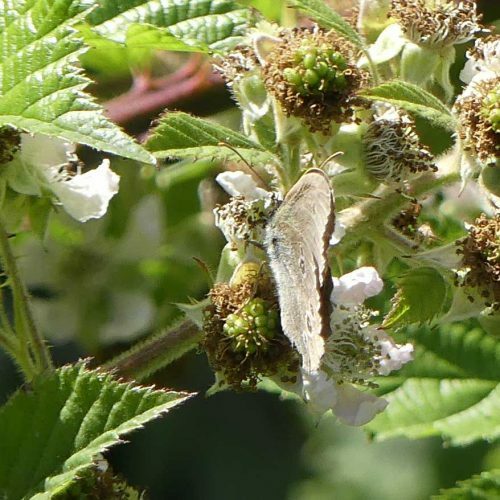 There are a whole host of different bramble species, which is possibly what accounts for them flowering and fruiting at slightly different times; a mercy at this time of year for insects seeking nectar and pollen. 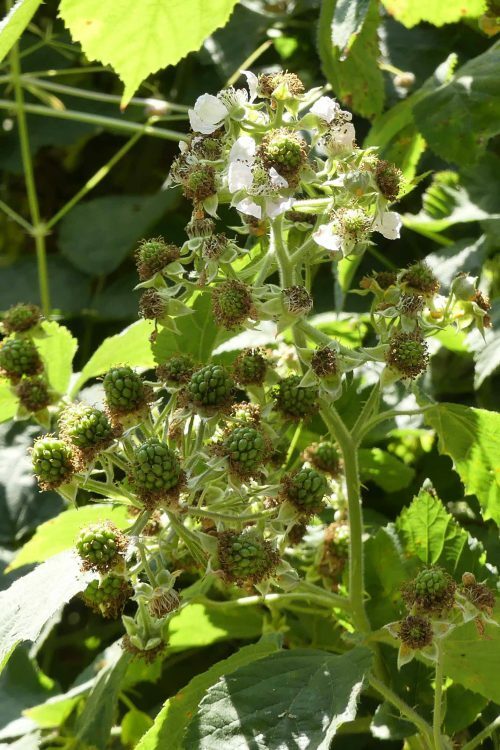 Many bramble bushes are down to their last few flowers and are busy setting fruits. They may not come to much if we don’t get rain to swell them soon. I would happily have stayed here for longer, but out in the open it was way too hot to stand in the blazing sun! Moving on along the trail there were very few flowers, some of the last are of Tutsan, but that too is also developing berries. 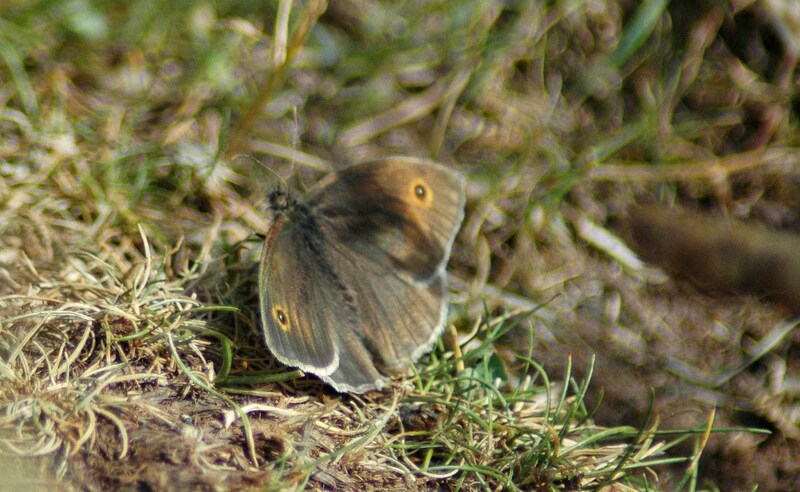 It’s unusual to see a Meadow Brown butterfly out in the open resting up on a leaf, especially opening up its wings to reveal its upper wings, but I think this one had not long emerged as it was still slightly crumpled. 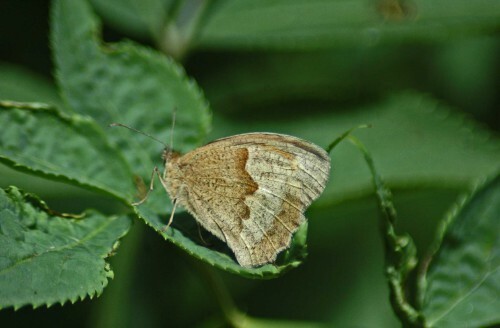 It may well have been a female as males tend to be a darker brown and may not have the orange patch. It was quite a relief to get back into the shade. 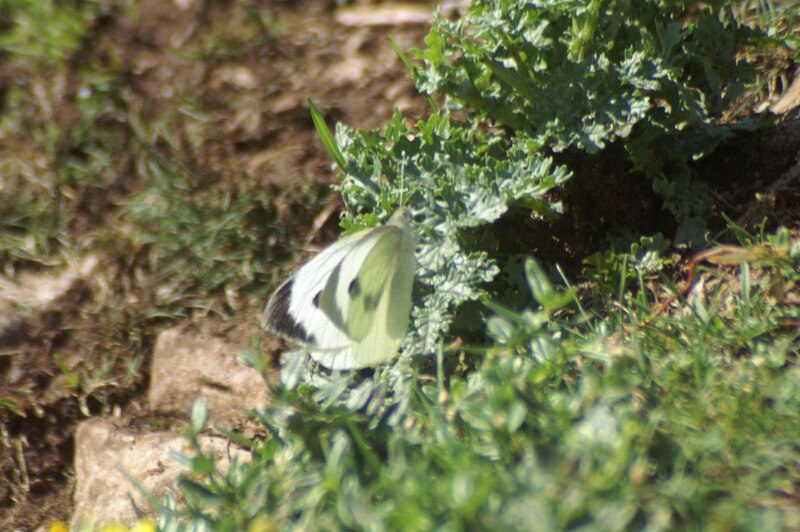 Another new, still-crumpled butterfly caught my eye; this one a Large White. 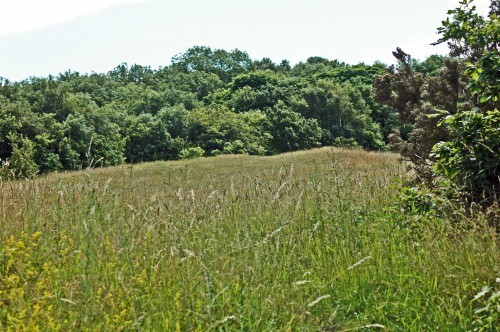 With no hint of a breeze to stir the air it felt even hotter out in the open meadow. The thin soil was baked hard, the grass browned to a crisp. 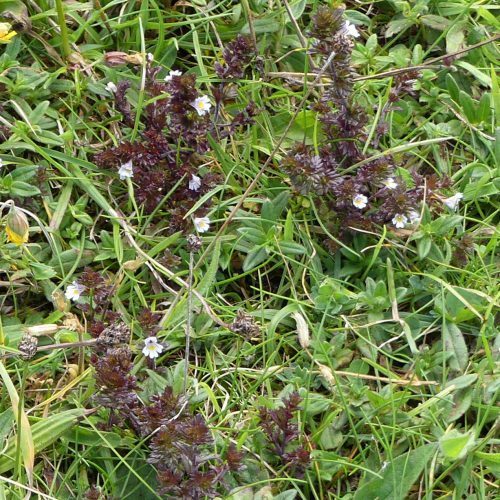 There are some green stems amongst it; there’s some Knapweed, its few flower buds small and tightly clenched closed. 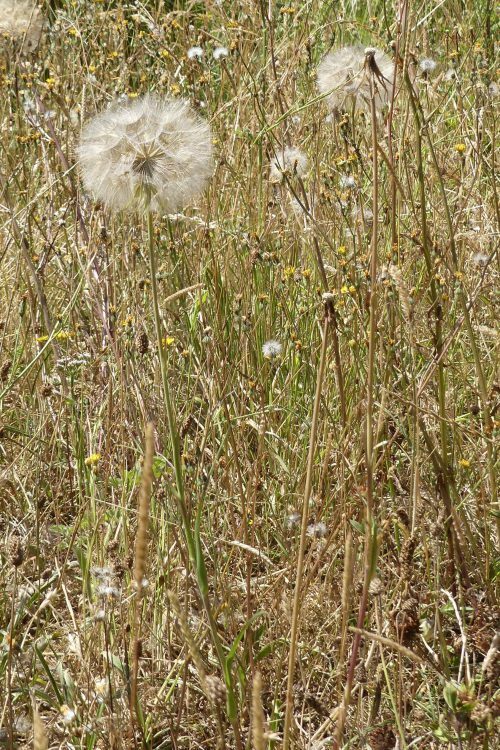 Goat’s Beard has kept some leaves, and green stems support its lovely big globular seedheads, or clocks. 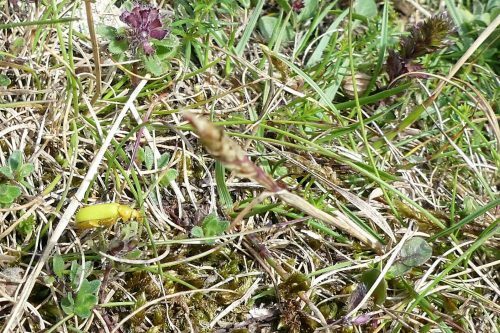 There are tiny yellow dots of a hawkweed/hawkbit in there too. A lovely big patch of Lady’s Bedstraw grows under a network of collapsed grass stems. 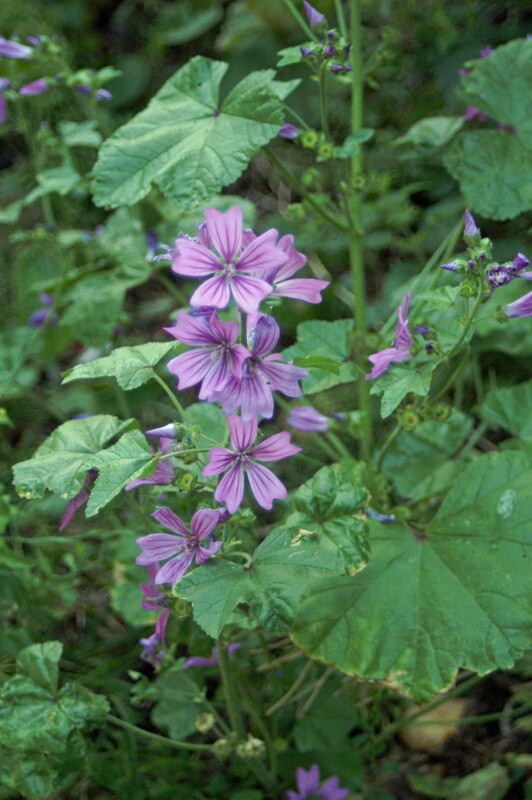 It too has retained surprisingly green stems and leaves. 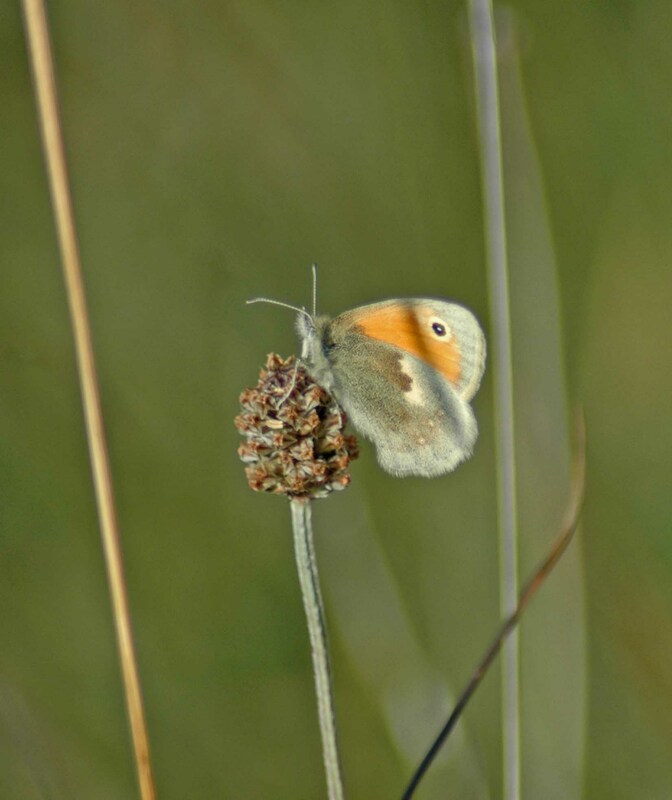 More Meadow Browns were doing what Meadow Browns do – that is flitting about amongst the long grass stems and landing in line with a grass stem that renders them barely visible. 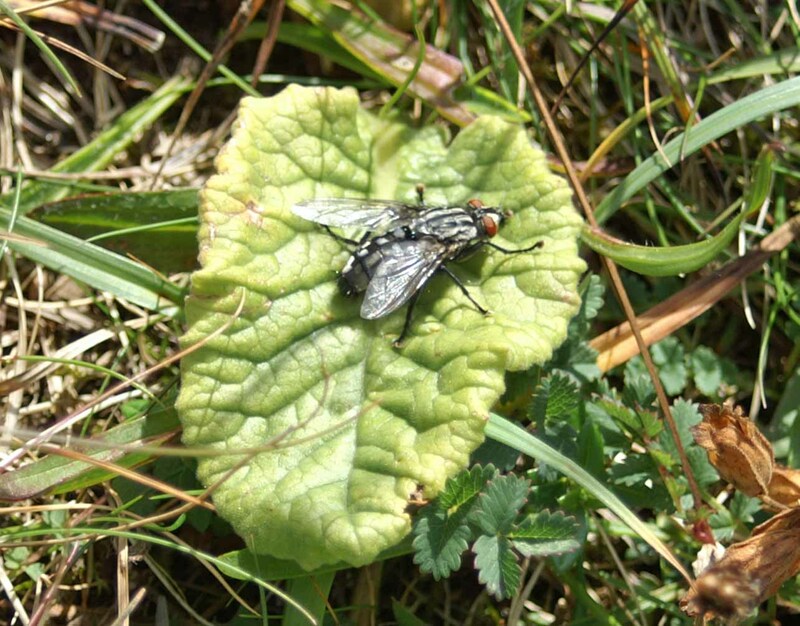 Two very small dark ones were feeding on a single plant of flowering Ragwort. Too hot to consider hiking over the summit of the hill and down again to make a proper circuit, I got to the bottom of the hill by cutting back into the woods to reach the bottom of the Summit Trail. 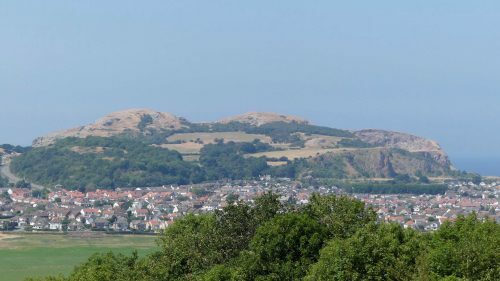 It was baking hot here too and although this is the cooler North side of the Bryn, it too is largely brown and very dry. 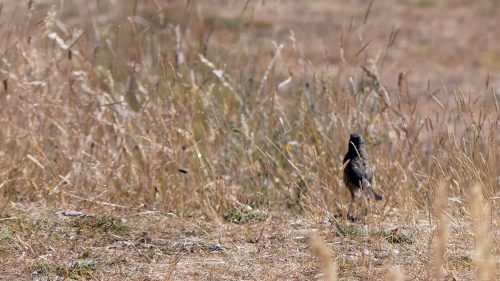 I was surprised to spot a bird out here, hopping around in the grass and not too bothered by me watching it. I only saw it from the back, but could tell it was a young Mistle Thrush. 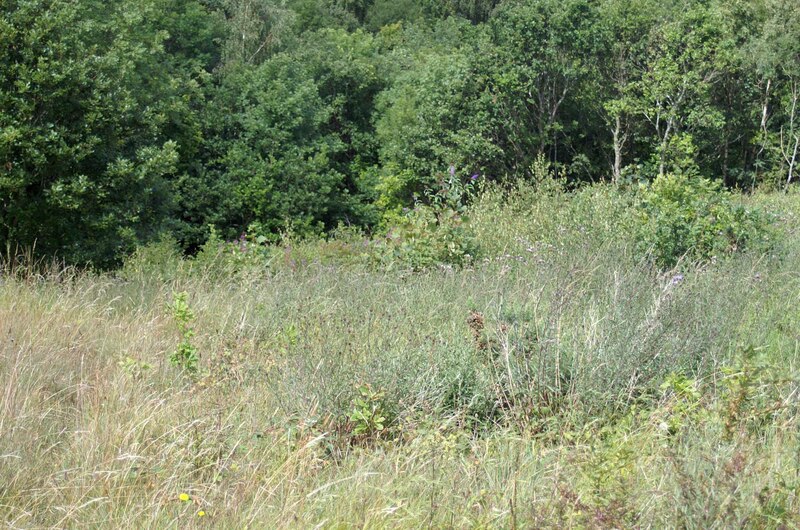 Greenery here is that of brambles, young trees, some grass and another stand of Rosebay Willowherb. 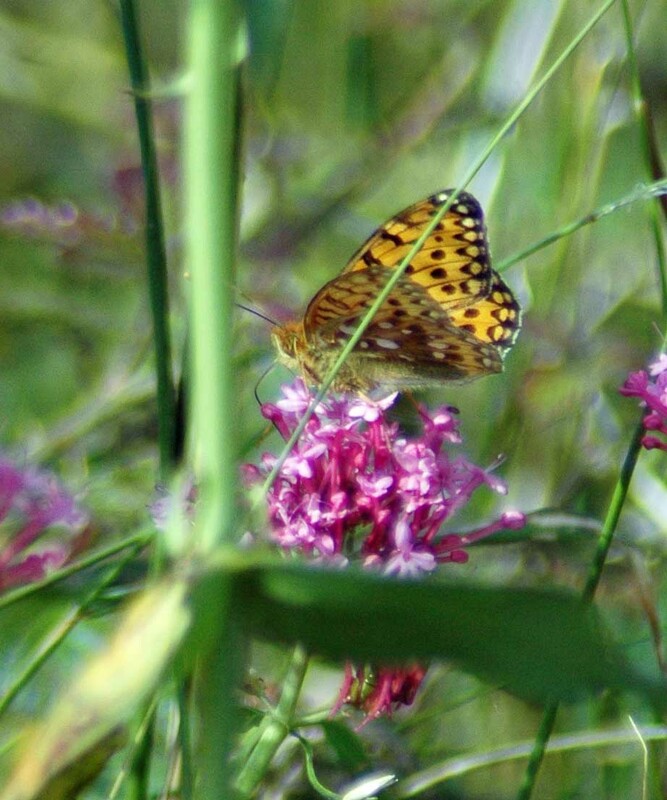 Knapweed is faring better here than in the small meadow and the first of its flowers are opening. Open flowers are sparse though and in high demand. 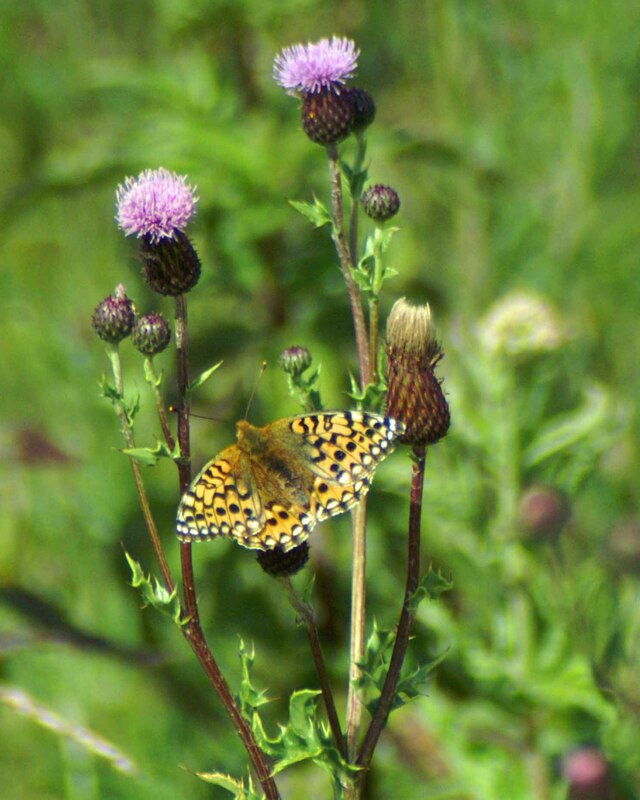 Where 6-spot Burnet Moths lay claim to a flowerhead they settle in for a good long time and are reluctant to share. I was here hoping to see a Dark Green Fritillary, but on first sight of the dryness and lack of flowers, didn’t have much hope. Then lo and behold I suddenly spotted a large fast-flying butterfly head for the very Knapweed occupied by a Burnet Moth. 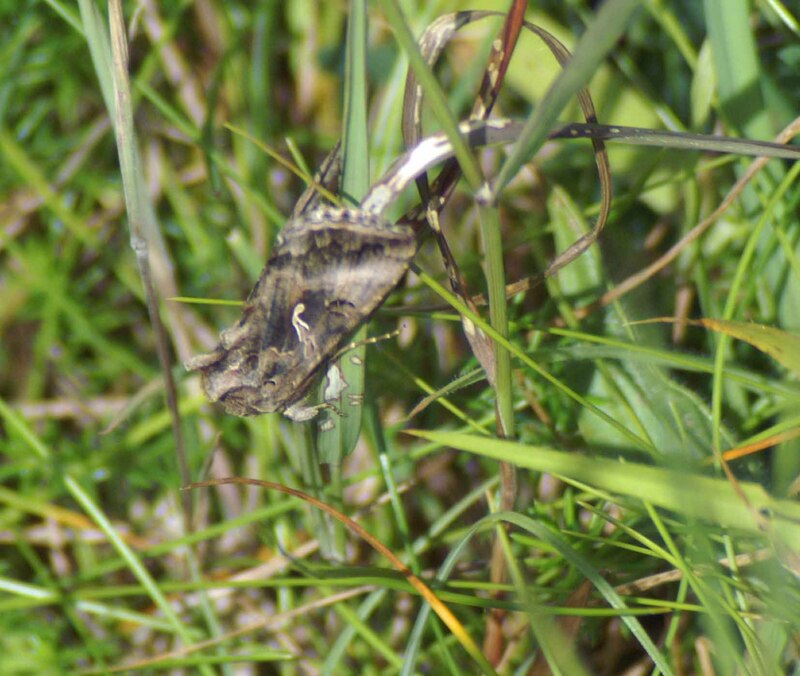 It tried to land but the moth denied it access and it shot off again. 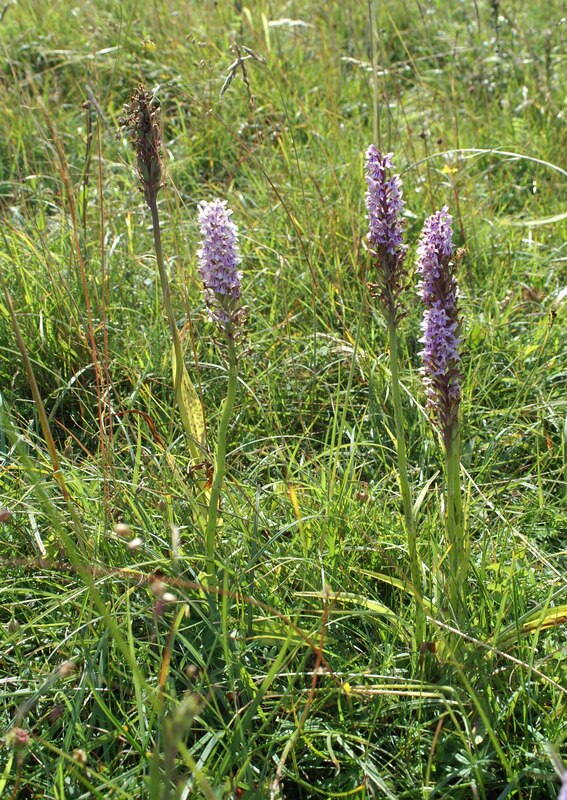 Fortunately it spotted an unoccupied flower nearby and settled, though only briefly before setting off again. 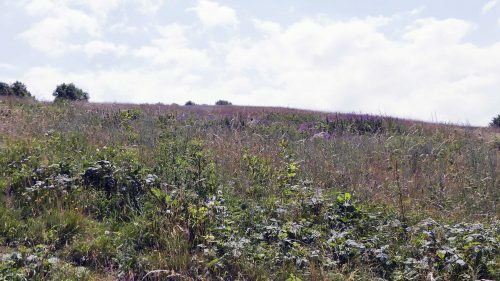 This part of the hillside, covered with long grass, brambles, gorse and pitted with rabbit holes is definitely off-limits for walking through, so no chasing butterflies! Best to stick to the few narrow tracks and hope something may cross your path. 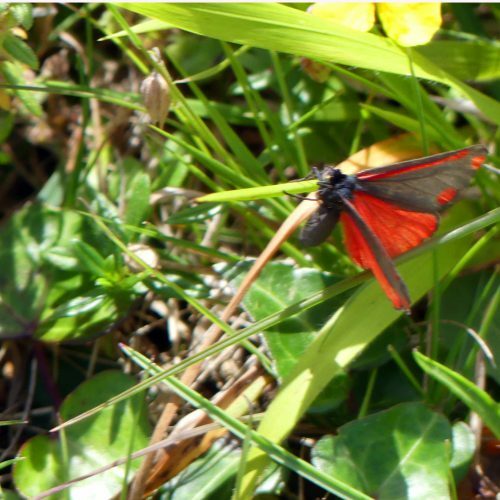 I did get a couple more glimpses of this gorgeous insect, but no more photo opportunities. I’m happy they are there and hope that there is more than one. Last evening’s weather forecast promised sea mist over the Irish Sea and so it has come to pass. 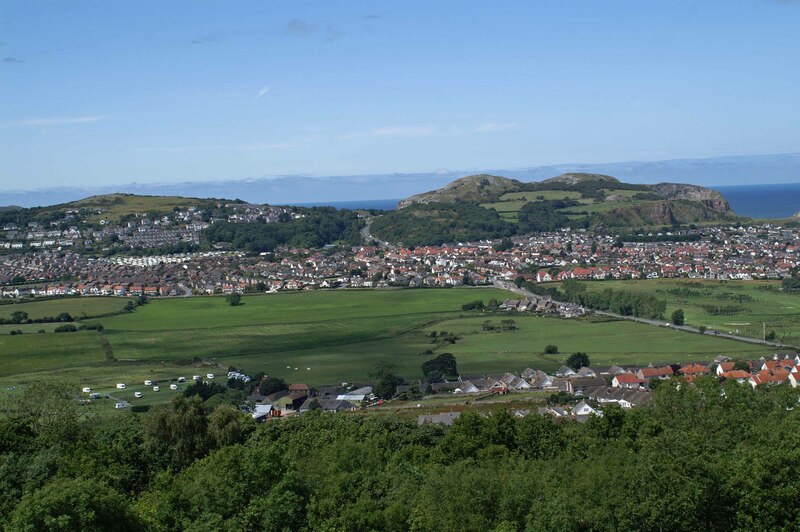 The whole landscape, including the Little Orme was veiled by it. It didn’t seem to being having much effect on the land temperature though. 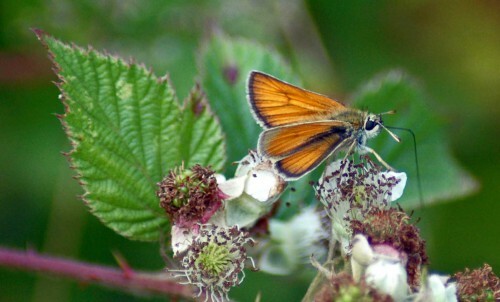 Peering around for the fritillary I did spot some Skipper butterflies. 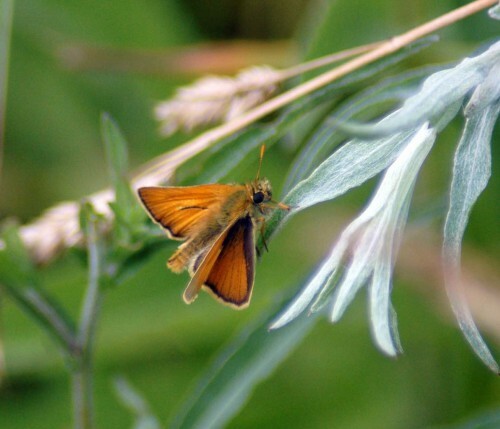 Several Small Skippers living up to their name, skipping through the grass and a single male Large Skipper that kindly settled momentarily to pose on a grass seedhead. 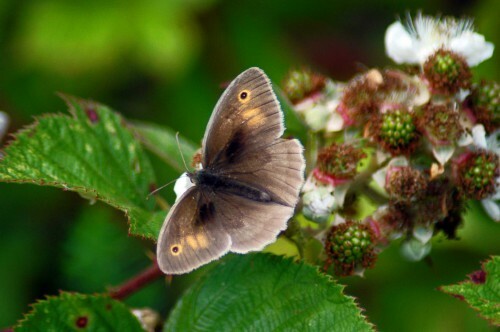 And more luck as a Ringlet settled on a bramble flower. It didn’t settle for long either as it was dive-bombed by Bumblebees. Time to get out of the sun. 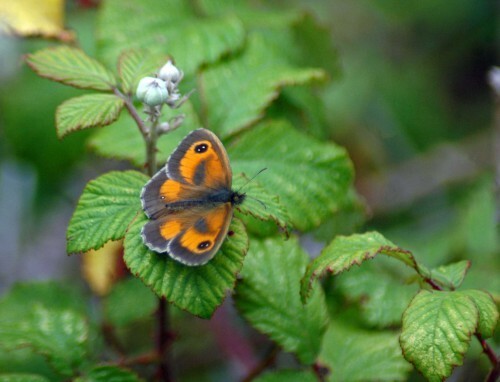 A passing glance at a Hazel tree on the woodland edge revealed a little bunch of ripening nuts, surprisingly not eaten yet by squirrels, and then a lovely fresh-looking Gatekeeper. 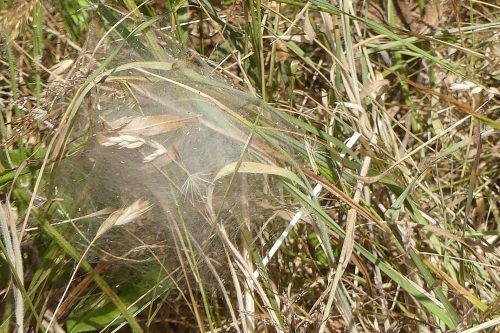 Back into the meadow on a different track I spotted the silken tent of a Nursery Web Spider, but no sign of its weaver. 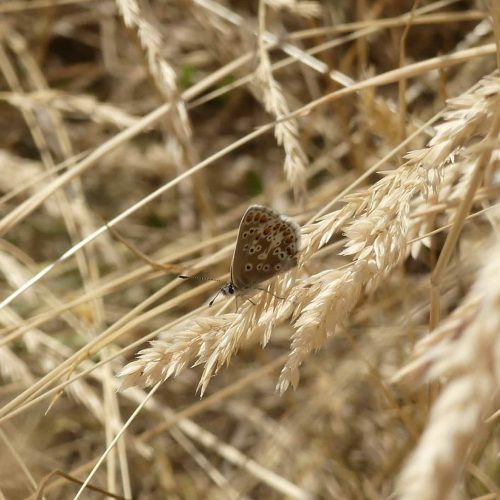 Then a tiny flutter of a butterfly; a Brown Argus. 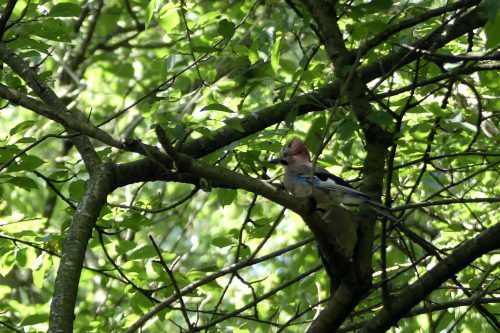 On my short-cut track back home, the sound of loud screeching drew my attention to a family of Jays up in the treetops; three together. One flew off, so I think it may have been two young ones demanding attention from a parent. One of those left in the tree wasn’t too happy though, you can see it has its crest raised. Such pretty birds and a good note, albeit a loud one, to end a walk on. Frothy sunshine-yellow Lady’s Bedstraw brightens the grass and on this warm sunny day scents the air with the delicate fragrance of fresh-cut hay. 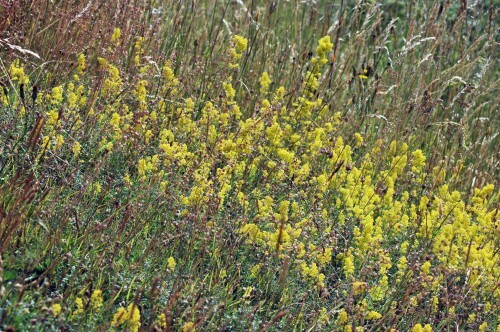 Medieval legend has it that the Virgin Mary lay on a bed of Lady’s Bedstraw in the stable of the inn in Bethlehem, as the donkeys had eaten all the other fodder. 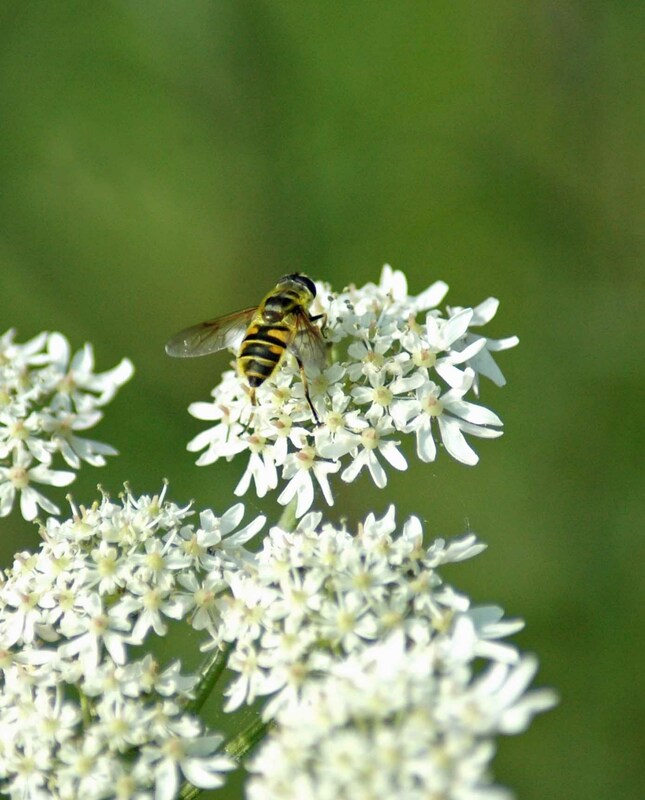 It is from this legend that the common name for the plant was taken, and also led to the belief that a woman lying on Lady’s Bedstraw would have a safe and easy childbirth. 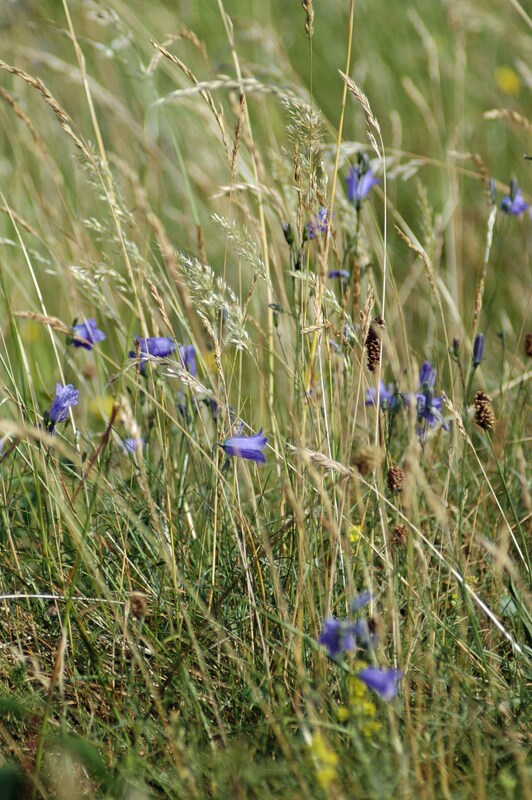 Lady’s Bedstraw is a plant of dry grassland, dry banks, downs and old established sand-dunes. On warm sunny days the air surrounding the frothy yellow flowerheads is deliciously fragranced with the scent of lightly perfumed fresh hay. 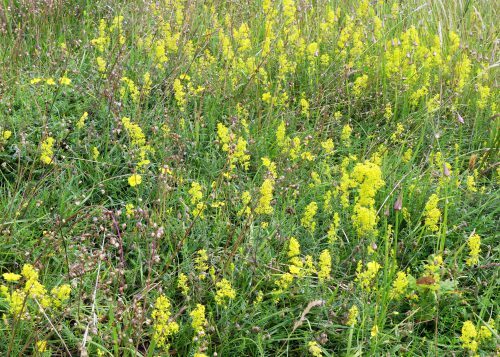 Lady’s bedstraw is a food source for the huge Elephant hawk-moth caterpillar, then is favoured by the adult moths as a rich source of nectar. The migrant Humming-bird Hawk Moths are attracted to it too. 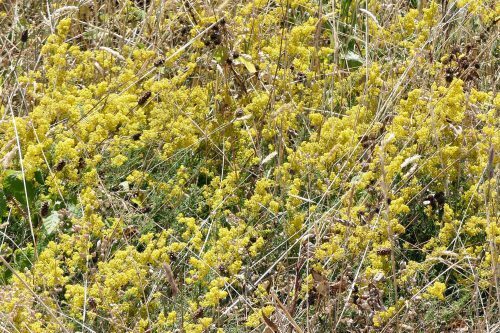 Lady’s Bedstraw was once one of the most useful of the meadow flowers; it was commonly used as a ‘strewing herb’, a natural form of air-freshening and for stuffing mattresses. 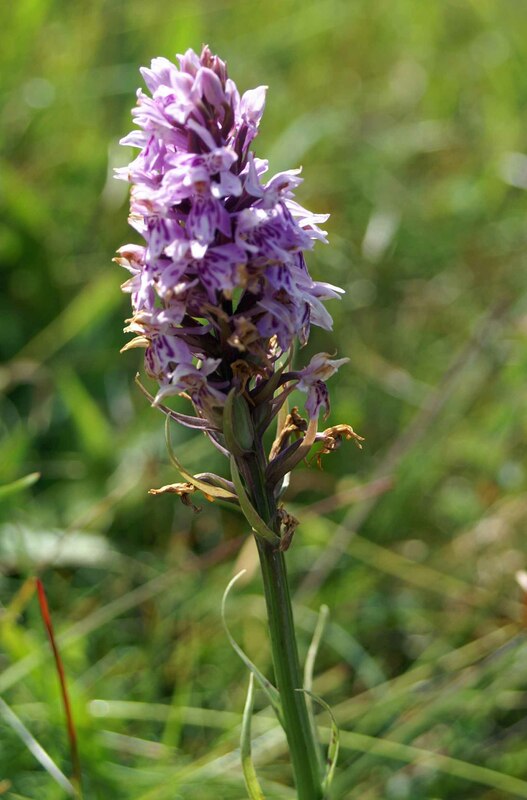 In the north of England the yellow flowers were once used to curdle milk, giving rise to several associated names such as cheese rennet and cheese renning. The leaves and stems yield a yellow dye and the roots a red dye; it was said that when cattle feed on it, it reddens their bones. 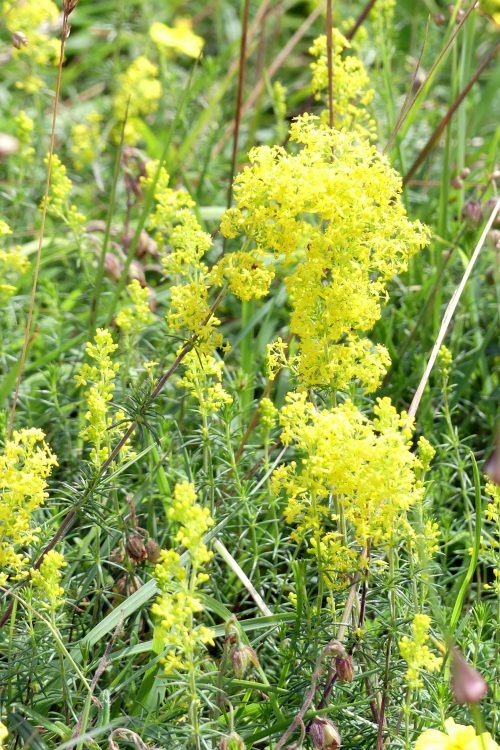 Lady’s Bedstraw contains the chemical coumarin, used in the drug dicouramol, which will prevent the blood clotting. 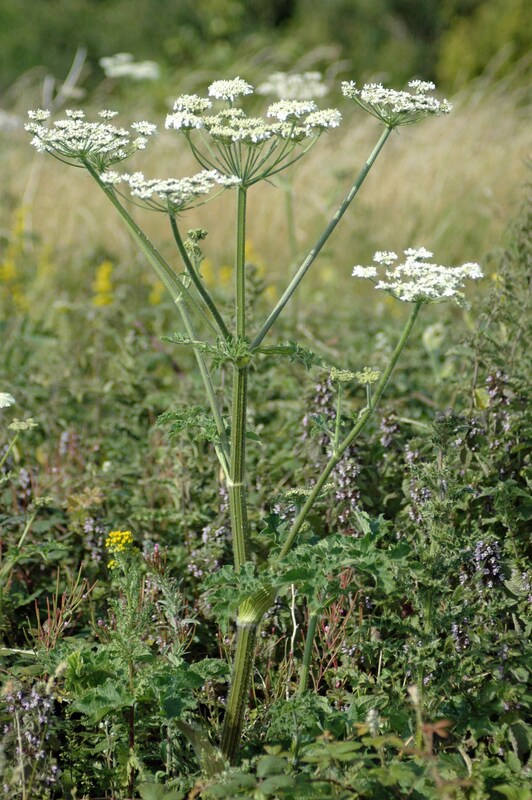 In herbal medicine it was claimed the herb was a remedy for for urinary diseases, epilepsy and gout. Keeled garlic, whose flowers attract Common Blue butterflies and the long stand of Hemp Agrimony on the woodland edge are in bud. There are tiny acorns on the Oaks; stalked ones on the Pedunculate Oaks and tight-to-the-twig ones on the Sessile Oaks. 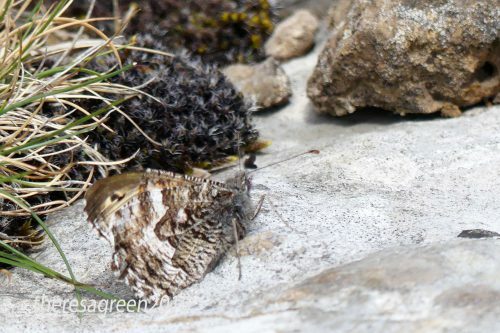 Up here on the near-summit rocky cliffs I spot a single lovely Grayling. 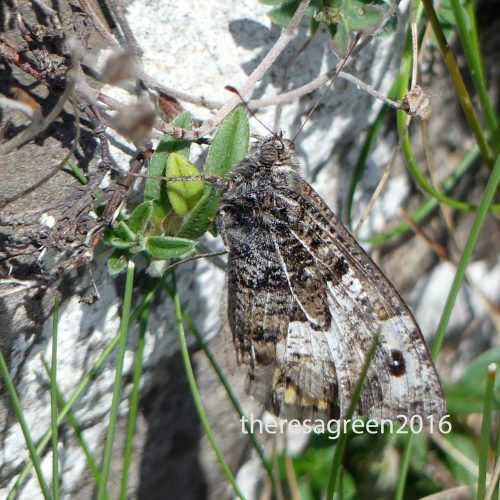 It settles on a warmed rock close by and I manage to catch it before it folds away the orange markings on its upper wings. 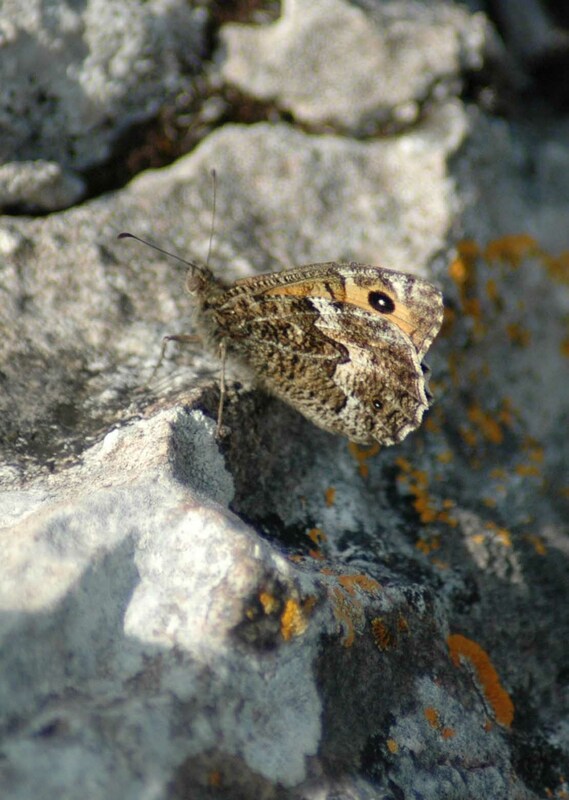 I am fascinated by the butterfly’s cryptic camouflage, its ability to melt into the rocks it settles on to bask. If I take my eyes off it I have to wait until it flits off again to relocate it. Unless it lands on my shoe! I was keen to get a good number of shots of this obliging subject, as in this location at least their appearances are not always predictable.This year I’ve had a few sightings, last year none at all. 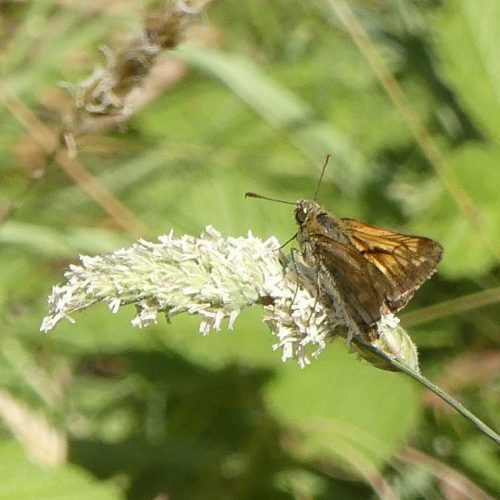 After a few minutes of following it from rock to rock I realised the butterfly had no immediate plans to go far, so I relaxed a little and sat for a while on a patch of grass. There’s a whole other realm cuched down in these often- dry grassy-rocky areas. 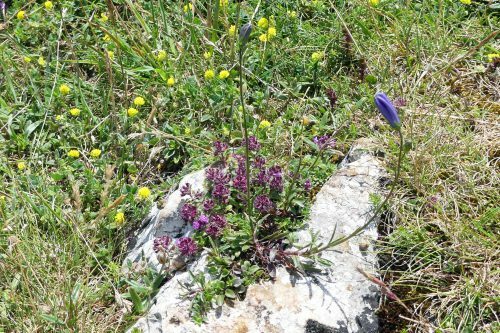 In the little patch where I chose to sit Common Milkwort was growing through Wild Thyme in a rocky crevice and nearby the tiny yellow dots of a creeping Hop Trefoil marked its presence, punctuated with taller purple-leaved Eyebright. 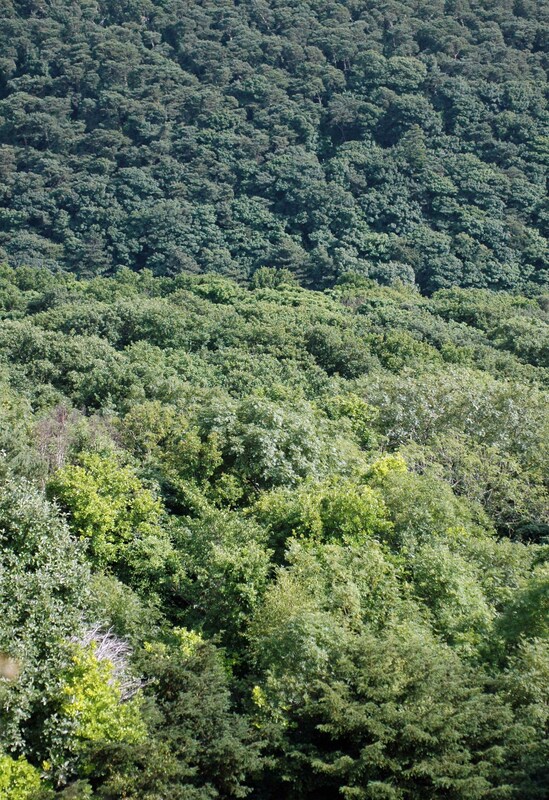 I spotted a bright yellow-green beetle scurrying through the vegetation, thinking this must appear to him to be a veritable jungle. 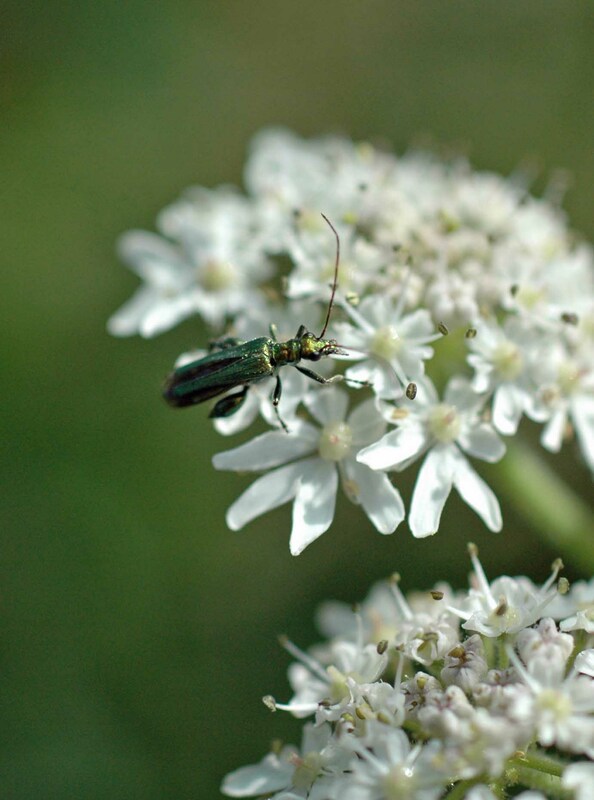 I had wondered what Sulphur beetles got up to when not gorging on hogweed. 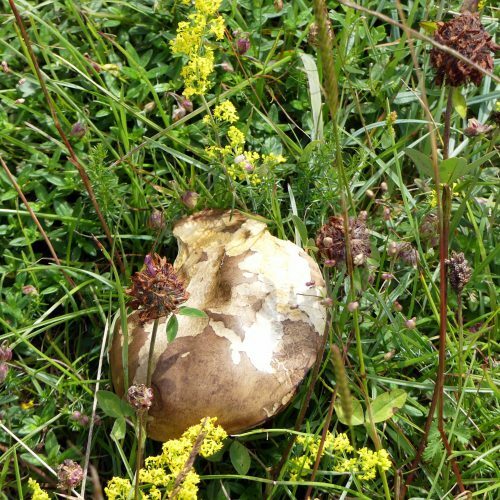 There were large mushroom-like fungi growing amongst the grass here. Many were clearly being eaten by something – voles, mice? Maybe even slugs or snails. 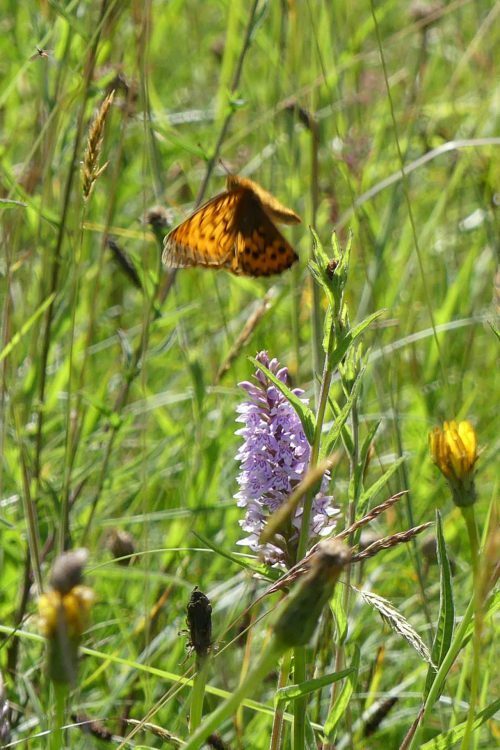 Then, further down the slope, the very thing I had been crossing my fingers hoping to see- a flash of orange that was a Dark Green Fritillary taking off vertically from a Common Orchid. 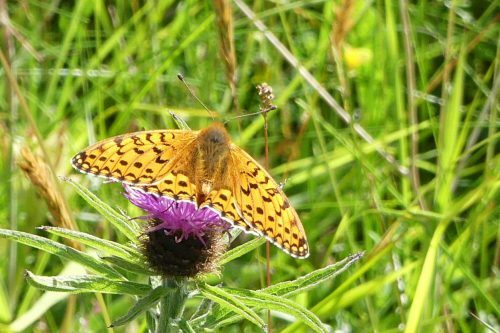 There is a small colony of these lovely fritillaries here; the most I’ve ever seen at the same time in a season was 10-12. 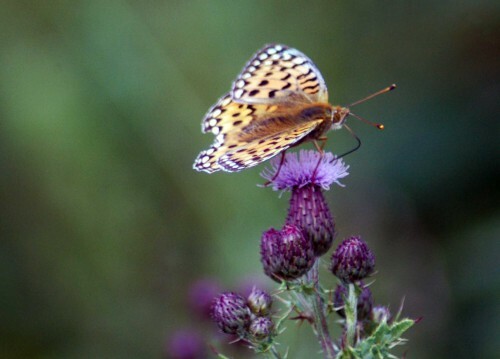 That year the Knapweed and Scabious they prefer to nectar on, were more fully in flower than now . Thus far I have seen only two at the same time. Today there was just the one. I hope there are a few more to come. 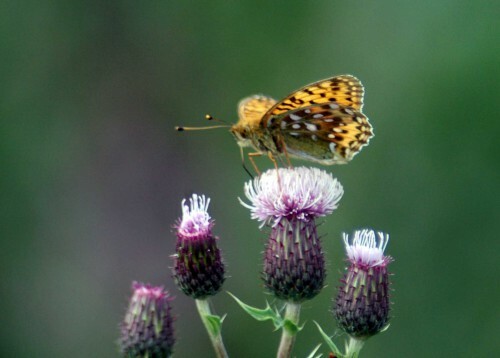 The butterfly returned to nectar on one of a few Knapweed flowers fully opened. 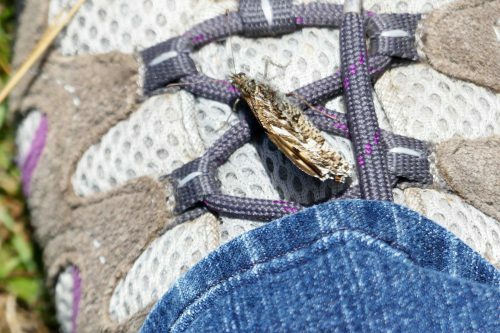 It shared the space with a chunky insect I am trying to find the identity of. 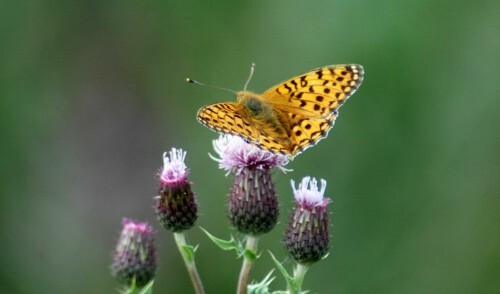 The fritillaries are large, fast flying and tricky to approach. 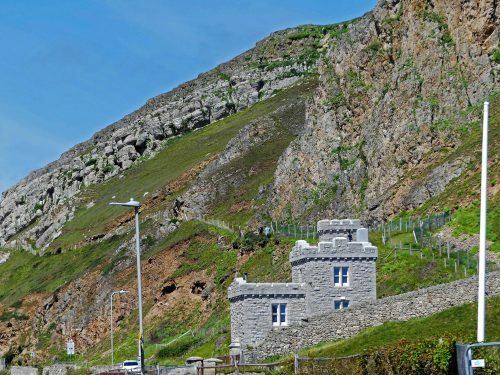 Sensibly they have also based themselves within a particularly brambly, steep and uneven part of the hill that restricts access. 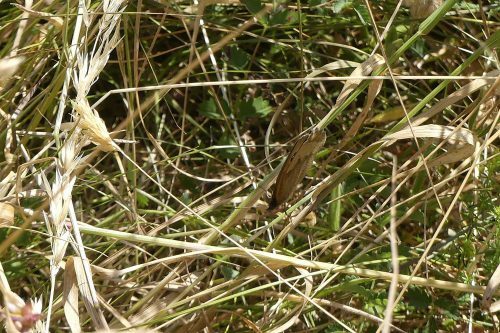 That means grabbing images as and when you can – but I like that, it keeps them ‘real’, so you see the butterfly as I did – mostly through a grass curtain. 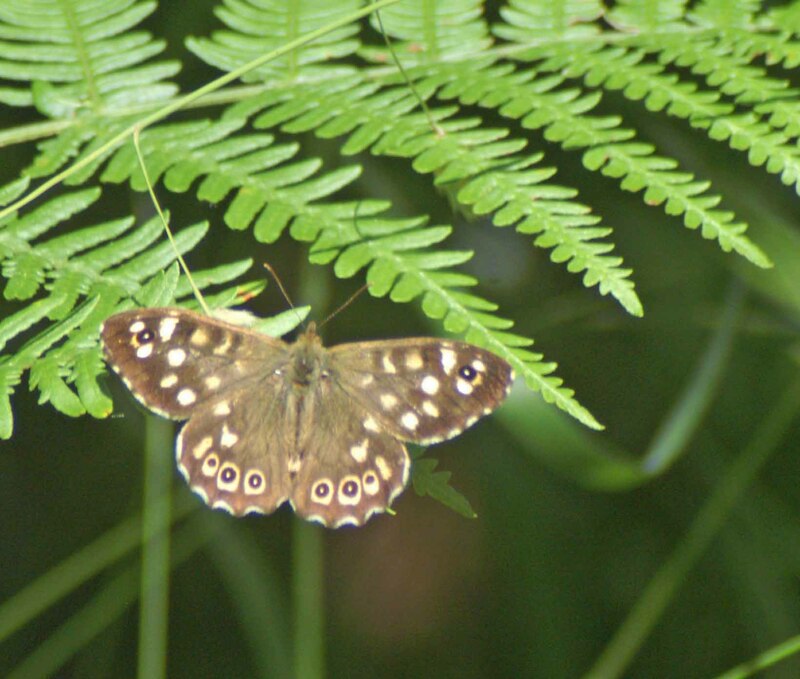 From the Fritillary patch to the bramble patch and sightings of Small Heath, a couple of Ringlets, a Large Skipper, Speckled Woods and hoverflies. 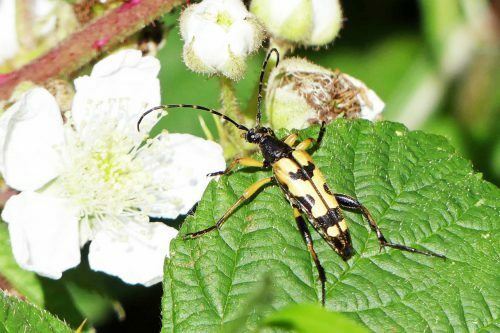 And to finish with a flourish, one of my favourite beetles, Strangalia maculata. I had thought about venturing a bit further afield today, maybe over to Anglesey, but weekends are never good for travelling any distances in this popular holiday location, and the North Wales Expressway (the A55) is the route to and from the ferry port of Holyhead too, so unless you leave early you can end up spending an uncomfortably long time in your car. 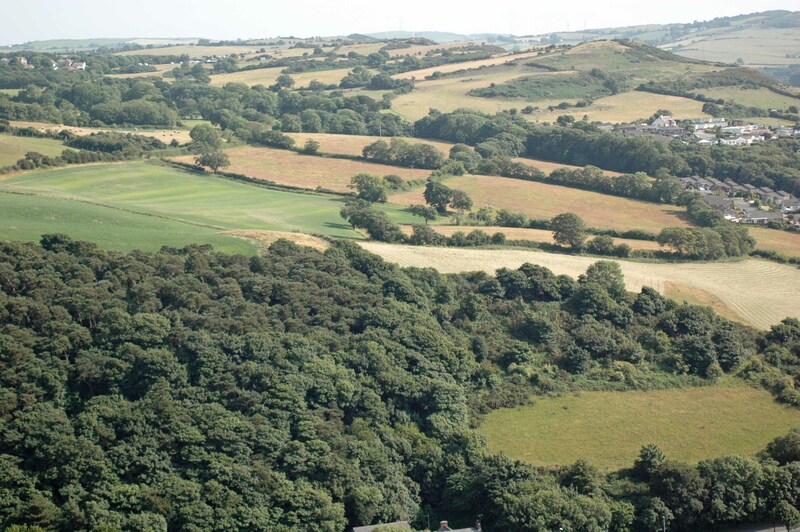 So I decided on Bryn Euryn instead, where I was hoping to get a glimpse of a particularly lovely butterfly. There were people picnicking in the field, so I headed straight for the top of the hill today, half expecting to find more people up there too, but there was no one at all. Most people head for the beach when its this hot. The view from here is always amazing as I’ve said so many times before and today’s gives an overview of the progress of summer. So, queen of the castle for a short while, I surveyed the land below and around me. There was a bit of a haze over the horizon, hay has been cut, dried out and rolled into big shredded-wheats ( for those who are wondering, that’s a British breakfast cereal), grass meadows are turning brown in the dry heat, wheat is ripening and trees and hedges add shape and texture to the landscape in a myriad shades of green. You also get a good view of the express-way from up here: I was so glad I wasn’t on it, it was very busy. 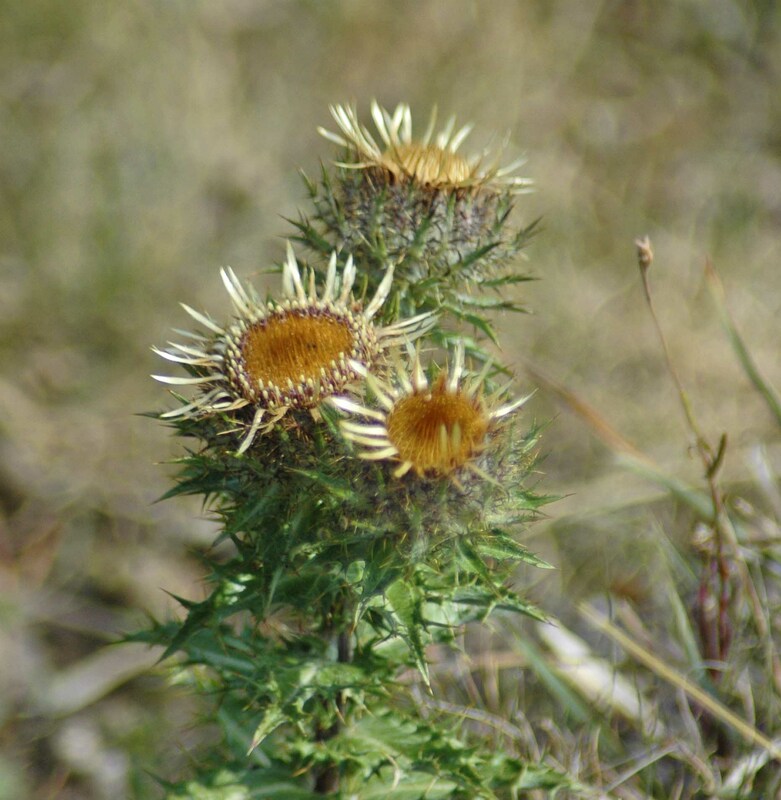 There are not many wildflowers that can survive the dry rocky summer conditions on this edge of the hill, where the rockroses bloomed so prolifically a few weeks ago, but one that can is the strangely attractive Carline Thistle, which looks as though it’s going to seed, but in fact its flowers are brown. 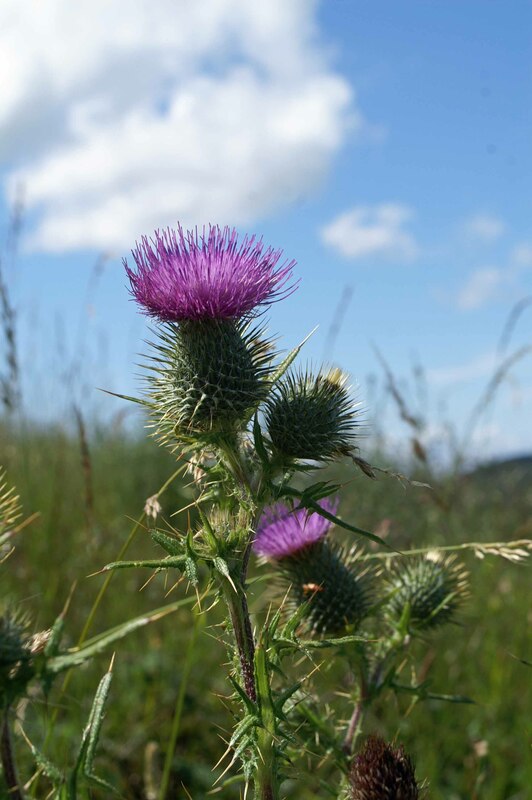 This species of thistle is found in several locations locally, but is a biennial and a bit unpredictable in its appearances. There were Small Tortoishell butterflies flitting about up here, basking briefly on rocks before disappearing over the cliff edge. Looking down I could see a number of them, maybe a dozen or so, very restless and taunting and chasing each other; at one point a group of seven of them flew up in a flurry, whirling around like mad things. 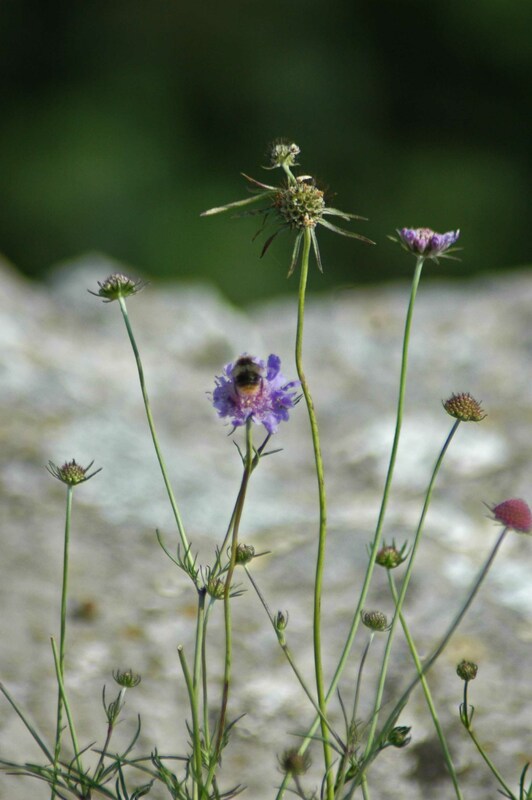 Scabious is beginning to put forward much-needed flowers; their nectar and pollen is always gratefully received by butterflies and bees. 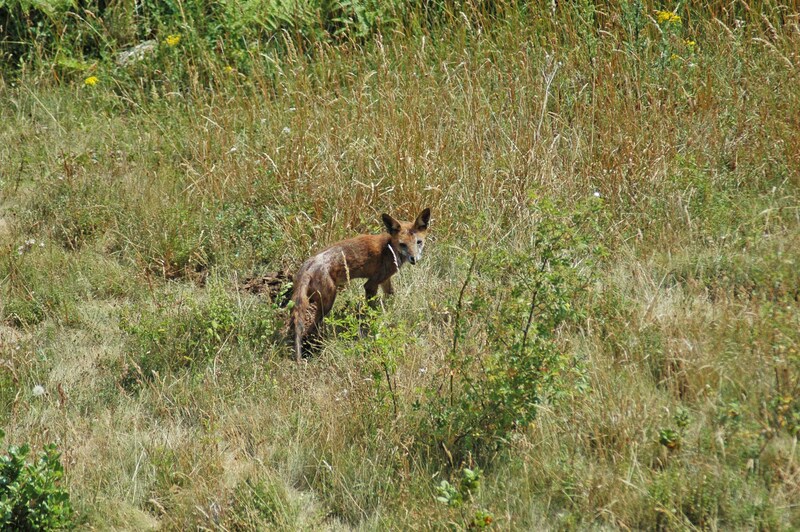 As I was peering over the edge of the cliff to watch the butterflies, I sudddenly realised someone was looking up at me; a fox, panting in the heat couldn’t decide if I was a threat or not so dived back into its den just to be sure. I couldn’t decide if it was a young animal or an adult, but either way it was not looking good. 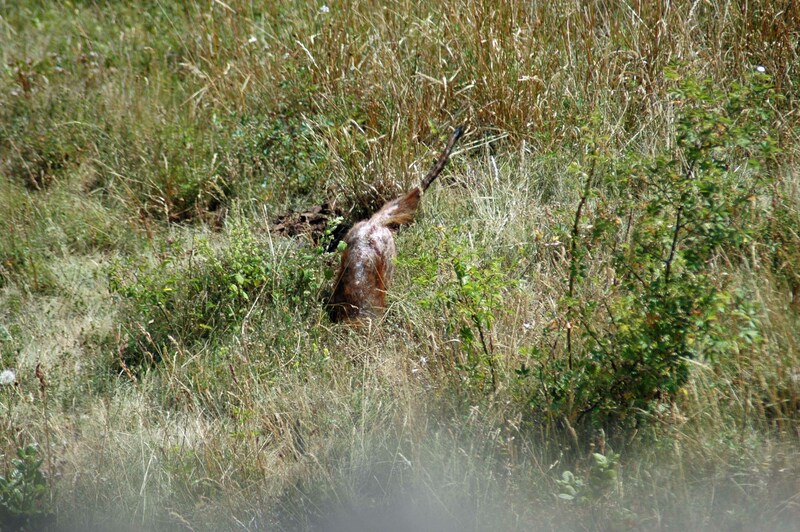 Apart from dealing with the heat it looked thin and its rear end and tail were devoid of fur, poor thing. 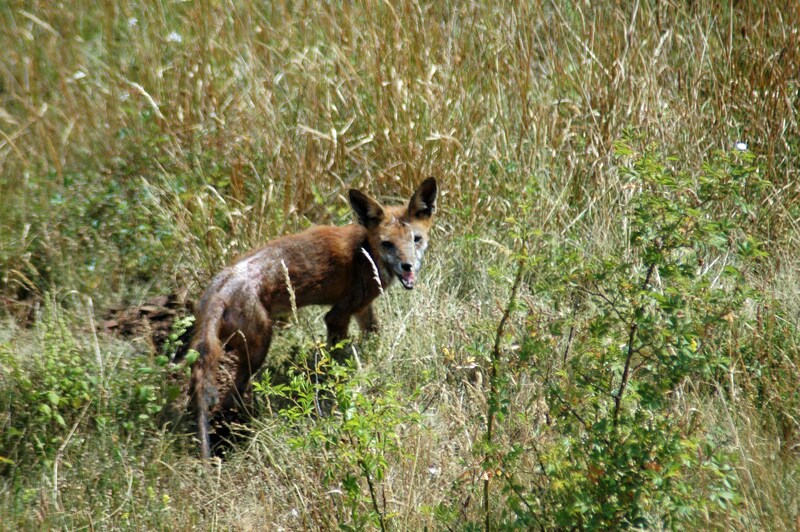 Does it have some horrible condition like mange? I moved on a little further back from the edge to where the grass is long and some ‘scrubby’ wild plants have been left to grow, perfect habitat for insects. 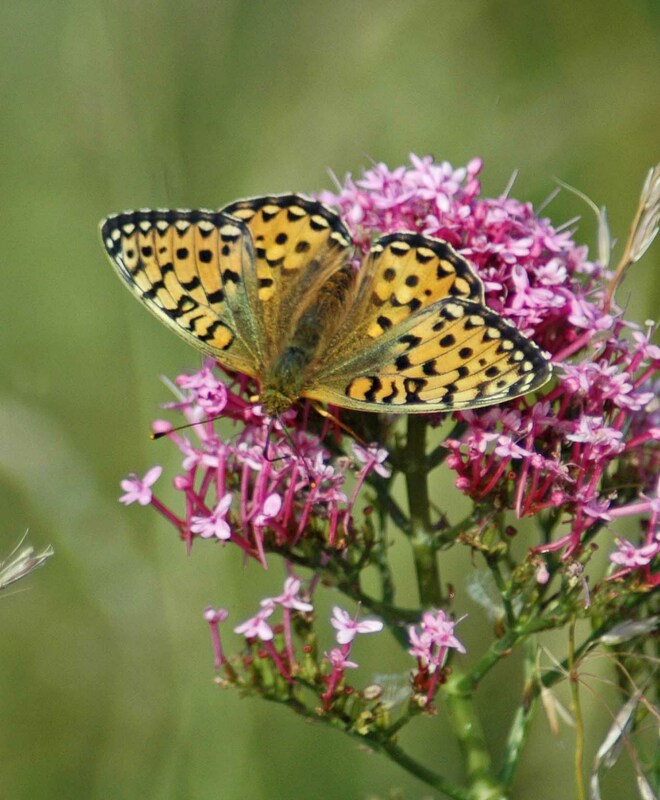 And lo and behold, the first butterfly to catch my eye was the one I had been hoping to see, a gorgeous Dark Green Fritillary, drawn by nothing more exotic than red valerian flowers. 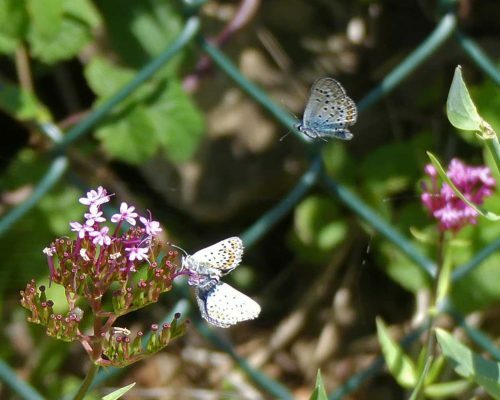 There were two of the beautiful insects flying around; these are fast, powerful fliers that can cover a large area in a short time. 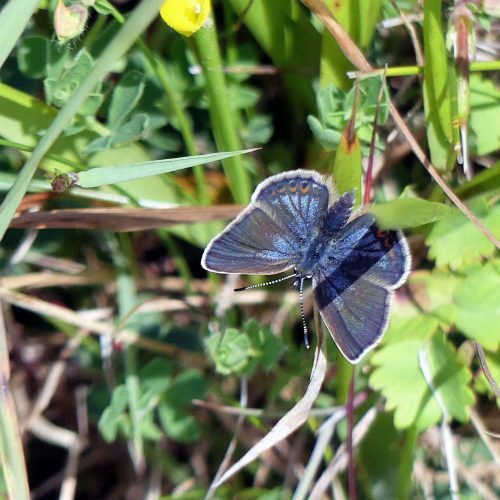 They don’t tend to leave their breeding areas, so once you know where to find them, providing conditions are good, you will more than likely see them there again. 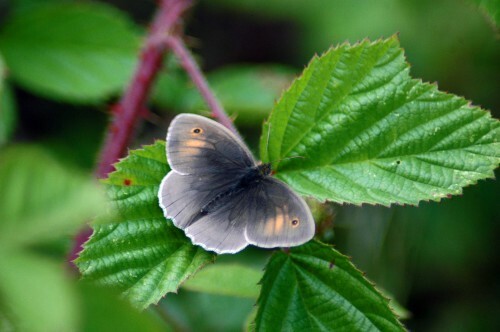 I didn’t see any last year, so was delighted to see some today and it was a bonus that they were ‘new’ and perfect. 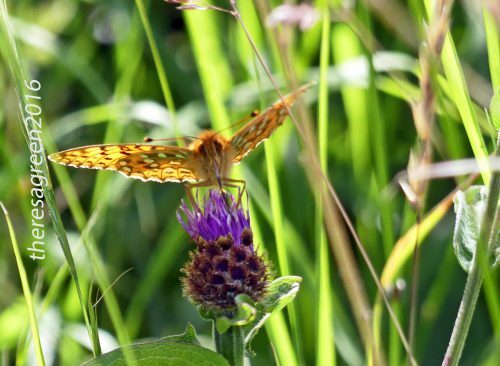 The butterflies were very mobile, and with no need to bask, not staying anywhere for long. I had no time for considered portraits, these were very much opportunities grabbed, but I was more than happy just to watch them. 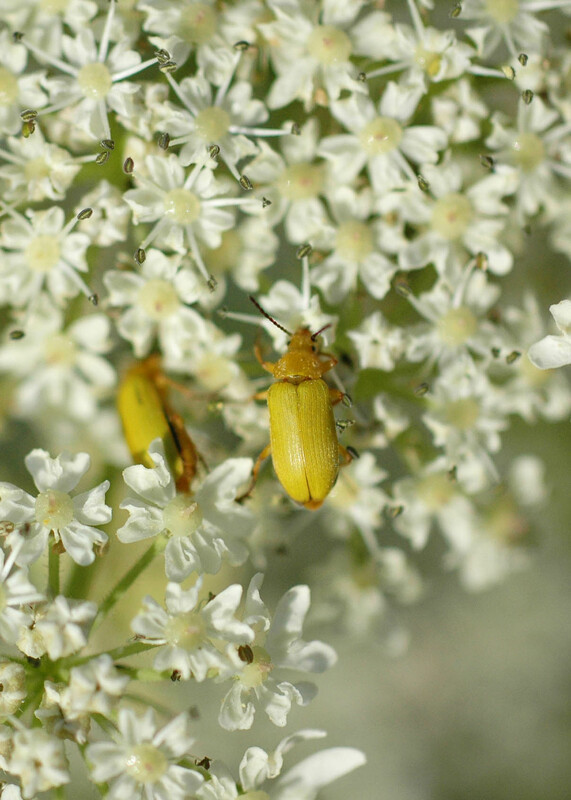 and two little sulphur beetles, Britain’s only yellow beetle and another new one for me. 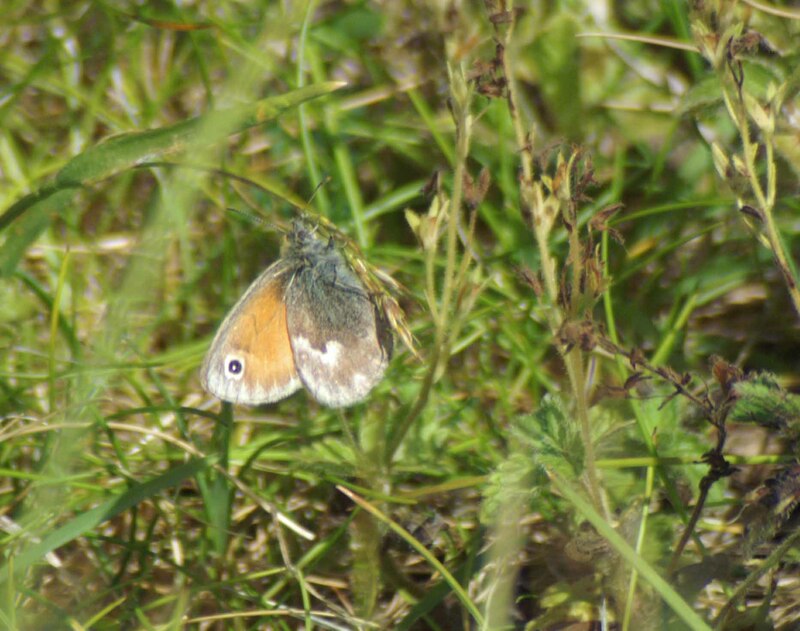 There were a lot of Meadow Brown butterflies in this area, and also Small Heath’s flitting along the pathways and low amongst the grass stems. I headed towards the proper summit of the hill and as luck would have it, was followed by a cute little dog and its owner, so took a diversion on a very narrow path around the rocks that I wouldn’t normally have done. 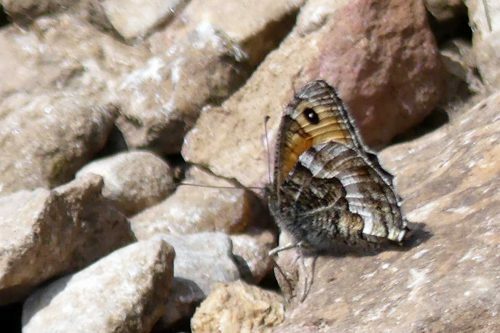 My reward was another lovely butterfly; this one not so colourful but a master, or mistress of camouflage, a Grayling. I was surprised to find just one other car in the car park when I arrived at ‘the Bryn’ on a warm sunny early afternoon last week; I had expected it to be busier, so was pleased that I would be able to enjoy this lovely but popular reserve while it was peaceful. The peace didn’t last long! 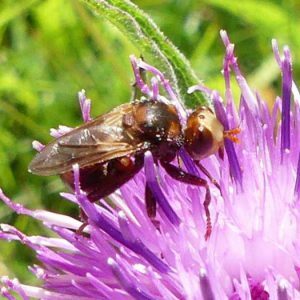 I began my walk with a circuit of the grassy area next to the car park, checking out the wildflowers for any interesting insects and was soon joined by a man walking a smallish dog. It appeared he was doing the job on sufferance, releasing it from its lead while he wandered around talking loudly on his mobile phone, breaking off frequently to shout at the dog. Things got even worse when another man with two dogs, both on leads, arrived, causing the loose dog much excitement and its walker to shout even more. I decided to leave this bit for another day and hurried off onto the stepped track woodland track towards the top of the hill. 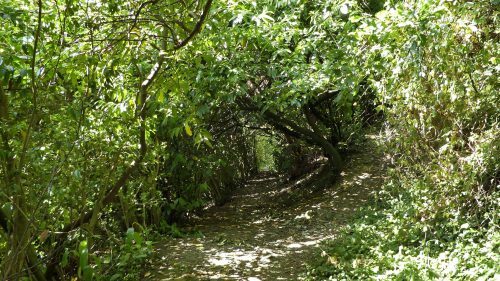 I stopped halfway up, in front of the cottage where the track divides as I caught sight of a large bramble bush covered with blossom. 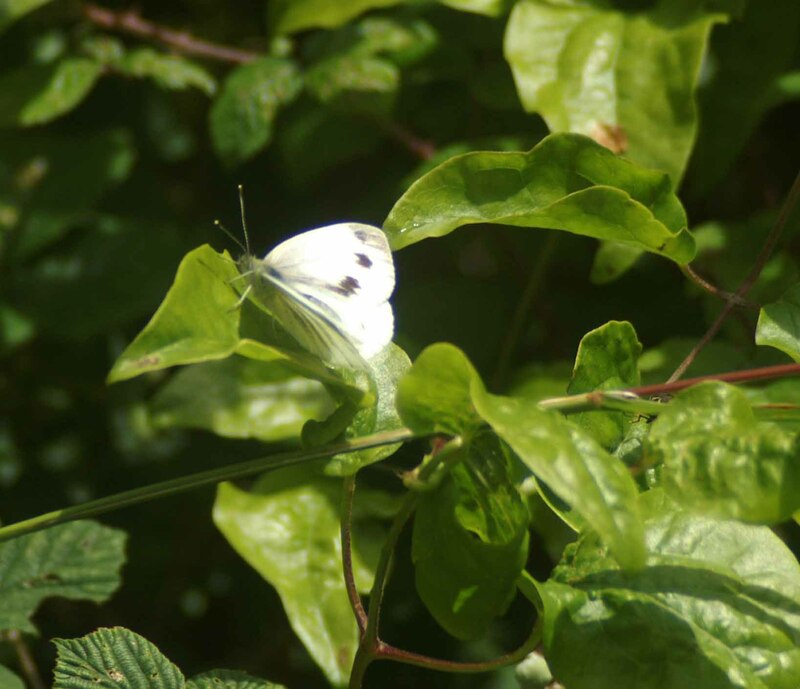 I saw a Comma butterfly feeding here but missed the brief photo opportunity; I also missed a Holly Blue, but I did catch one of a Green-veined White basking on a clematis leaf. The woodland was silent, usual at this time of year due to the lack of birdsong and calls, but making you wish you could move more quietly and be less conscious of every footfall you make. 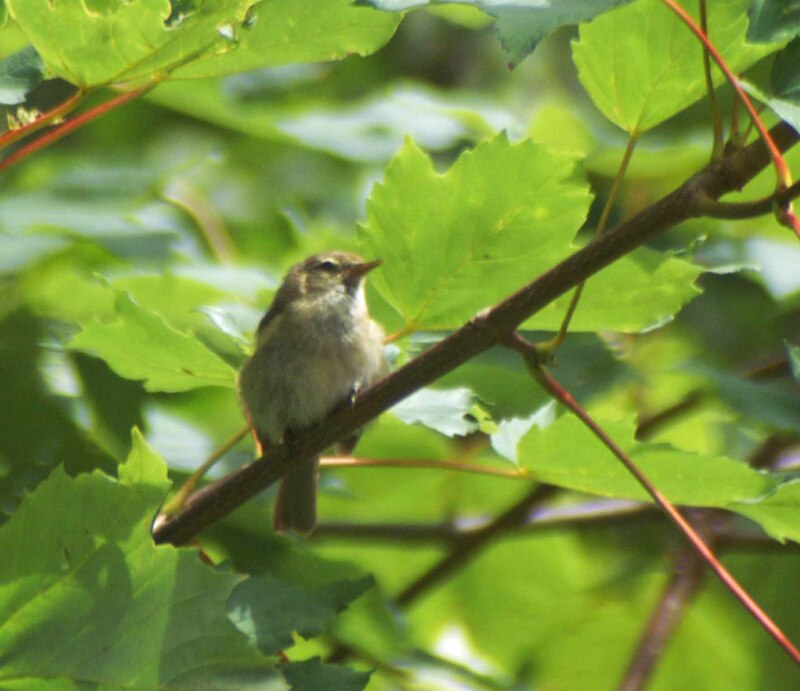 I was taken by surprise when the silence was broken by a soft ‘huit’call from close by and I looked up to see a young Chiffchaff in a sycamore tree. 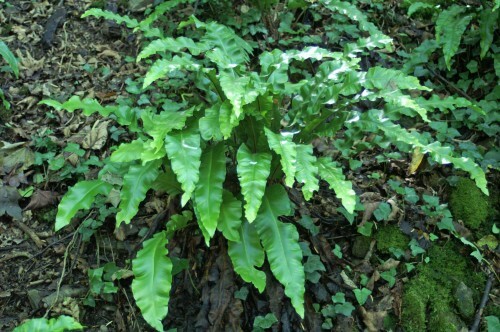 The foliage of the woodland trees is still fresh, not yet showing the dusty tiredness of late summer, the greenness is carried through and down to the floor beneath, accented by glossy Hart’s Tongue ferns and cushions of soft green moss. 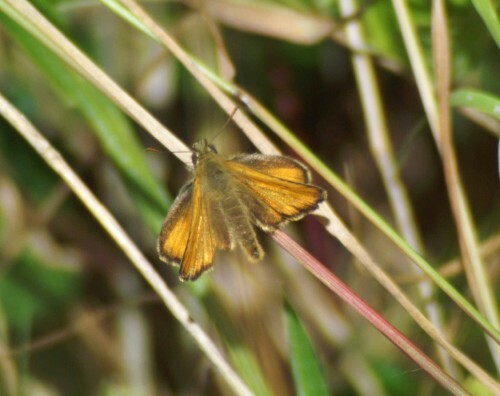 Emerging from the dappled shade onto the grassy hilltop my eye was caught by the low fluttery flight of small orange and brown butterflies- Small Heaths, several of which were flying in quite a small area and looking perfect and newly-emerged. 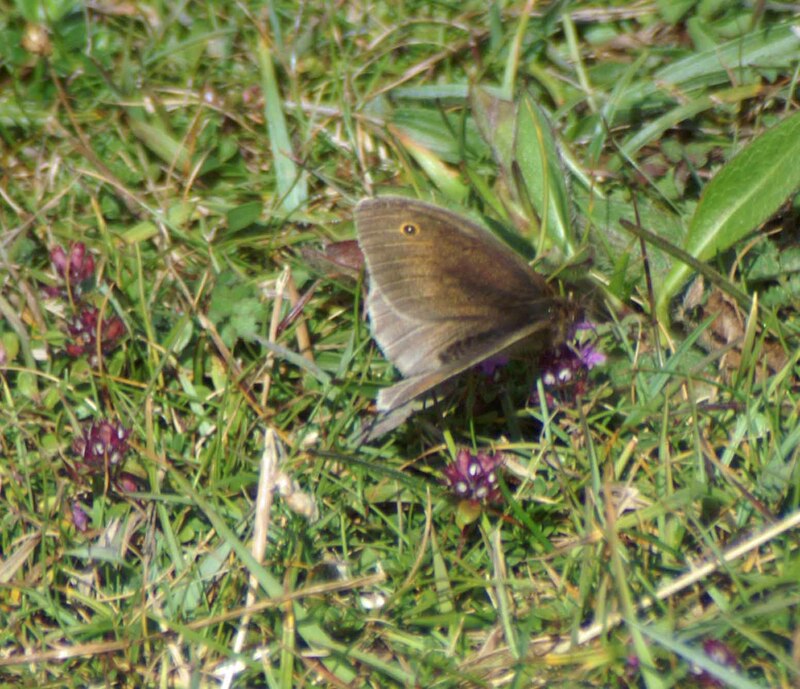 There were a lot of Meadow Browns too, keeping low to the ground and often disappearing from sight as they tucked themselves down on the ground amongst the grass stems. I carrried on round the hilltop admiring the stunning panoramic views stretched out beneath and across to the Snowdonia mountains, making for the summit, then continued on down the other side onto the grassy meadowland. 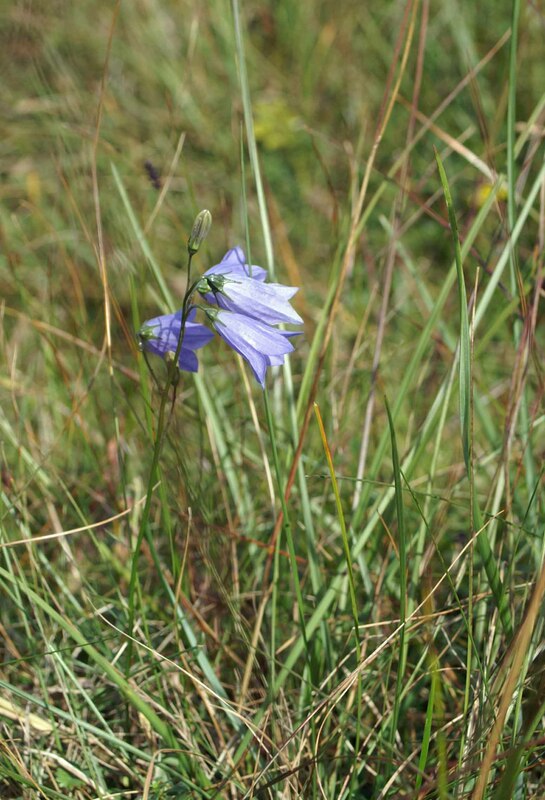 The grass was studded with beautiful blue Harebells that look dainty and delicate but must be pretty hardy to thrive in the habitats they are found in. 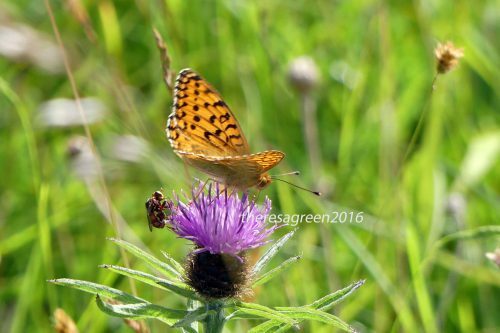 I had half-decided to continue walking down the slope to the woodland at the bottom, but as I passed by the area where the grass has been kept longer and where brambles, thistles and knapweed were flowering, I caught sight of a large brown butterfly flying fast and strongly, that then landed on a knapweed flower. 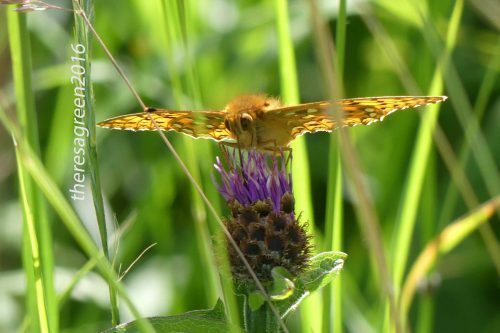 Unmistakably a fritillary, although I had no idea of the species: its colours looked rather faded and it there was some damage to the wing edges, so it may have been around for a while and I didn’t get sight of its underwings. 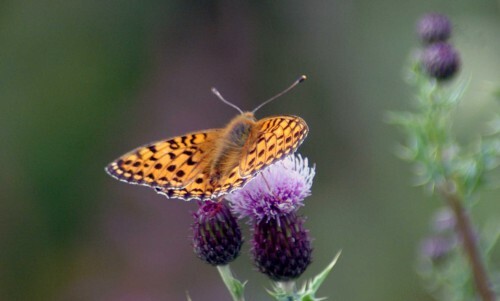 Checking later on I think its most likely a Dark Green Fritillary, but as ever I’m happy to be corrected. 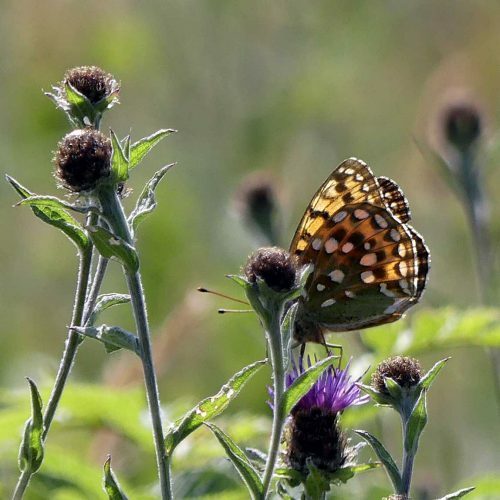 I sat on the grassy slope for a while hoping for more fritillary sightings, which happily I got; in addition there were more Green-veined Whites and several Small Skippers flitting around low amongst the long grass. 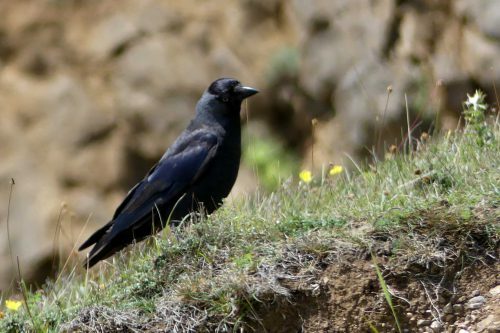 I heard the ‘bark’ of a Raven and just caught sight of it as descended, landing somewhere beyond the slope out of sight. A Buzzard circled overhead. 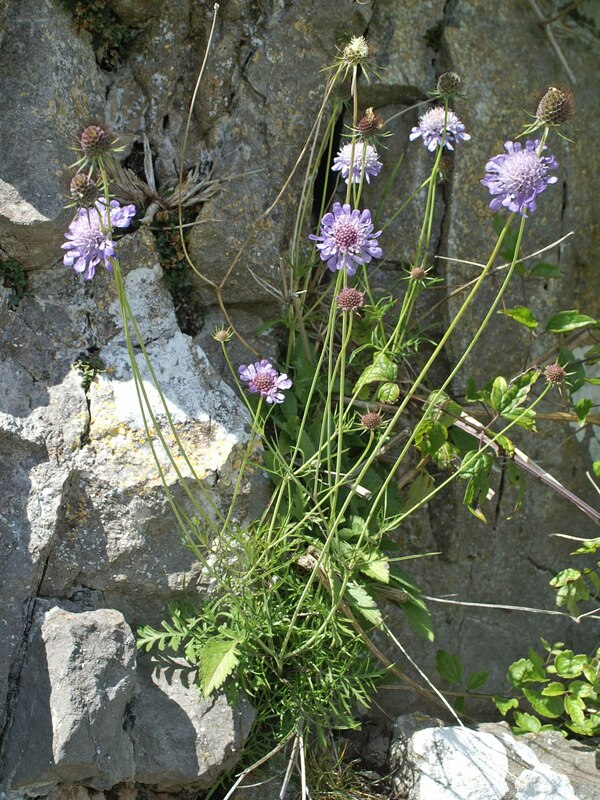 Preparing to leave and retrace my steps I crossed to the other side of the slope, took a photograph of the Little Orme and spotted a lovely specimen of Thistle. Leaving the orchids I was more than happy with my afternoon’s discoveries and turned to head back up to the summit then down and back to the car. 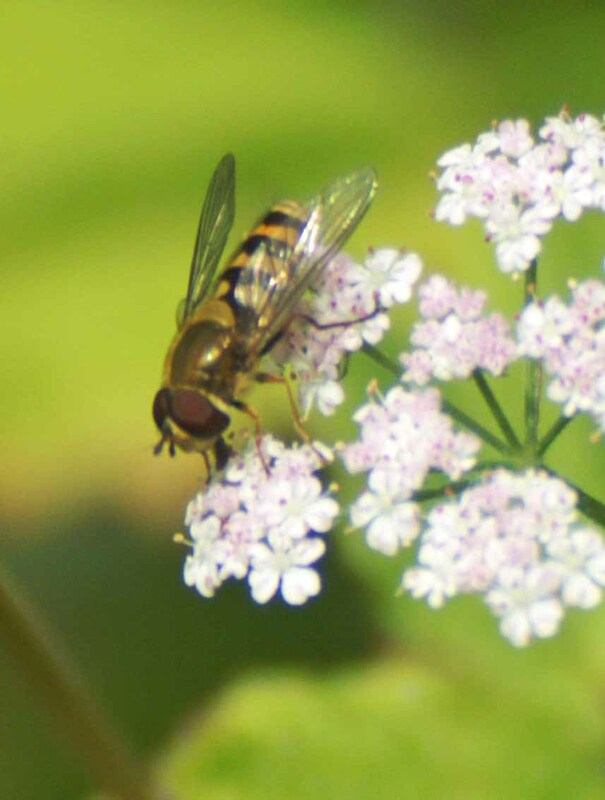 I couldn’t resist sitting to gaze at the view for a few minutes and got distracted by flies, flesh-flies to be accurate, that have rather unpleasant eating habits, but that actually look quite attractive. 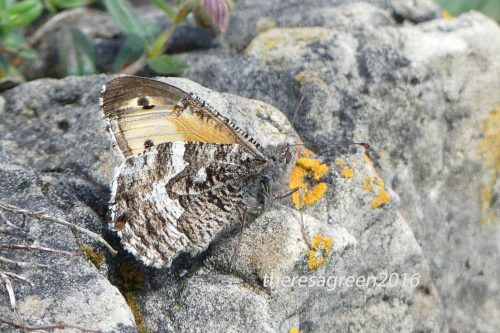 Making my way back down the slope I spotted another butterfly land on a warm rock, a gorgeous Grayling. 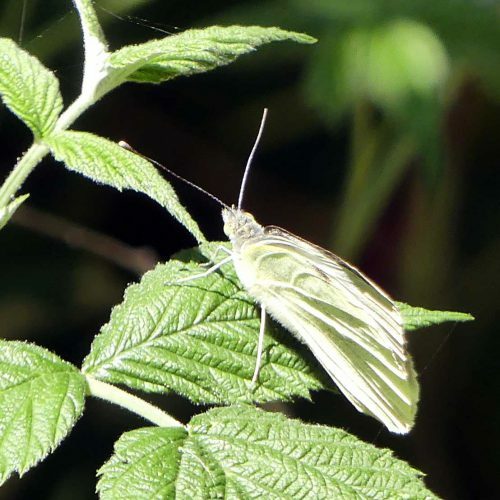 Then close by a female Large White landed on a leaf. 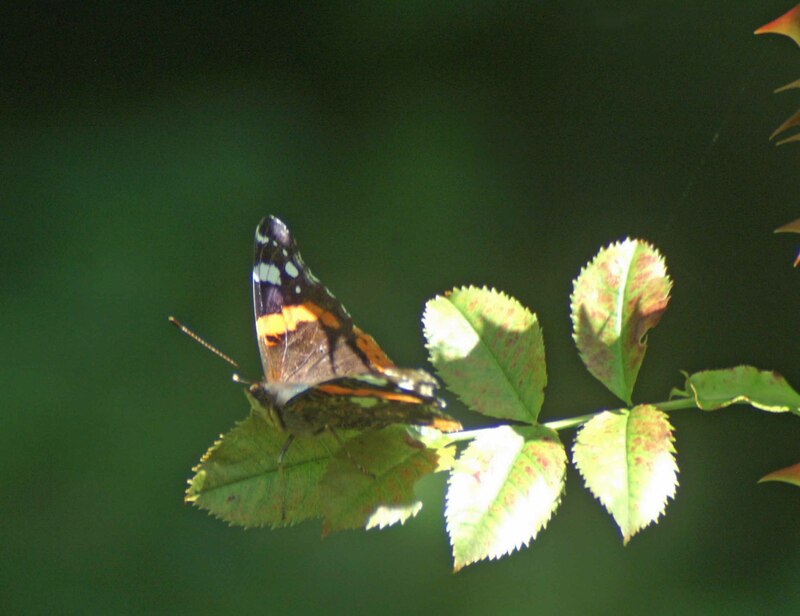 Finally reaching the top of the path downwards I very shortly stopped again for yet another butterfly, this time a Red Admiral that posed beautifully on a wild rose leaf in a spot of sunlight. There were more people around as I made my walk down, most of whom were walking dogs. I made a quick stop at the brambles where I’d seen the Comma earlier, hoping it may return, which of course it didn’t, but I did see some young Chaffinches in a tree there. As I got close to the bottom of the hill I caught sight of a bird on the ground tugging at something it had found. It was a Thrush and by the way it took little notice of me I assumed it was a young one. I attempted to photograph it but it was far too shady there, so I just stood and watched it for several minutes. It carried on foraging quite untroubled until we both heard the ‘mewing’ of a Buzzard and the simultaneous rough cawing of a Crow. The Buzzard, again I think a young one, came crashing through the trees and landed on a branch, looking very ruffled and quite upset: I assume the Crow must have pursued it there. The Thrush was long gone. 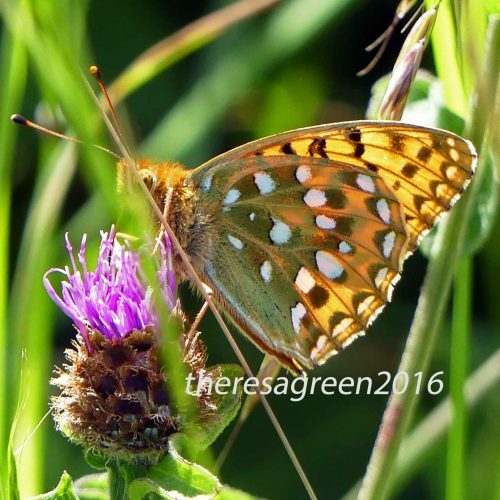 My total butterfly sightings were from 11 species: Large White, Green-veined White, Comma,Red Admiral, Dark Green Fritillary, Grayling, Small Heath, Speckled Wood,Meadow Brown,Holly Blue & Small Skipper.